On November 8, 2018, the small town of Paradise, California was destroyed by the devastating Camp Fire, the largest wildfire in California's history—yes, more massive, but similar to what many other California communities have also experienced in recent years. But with tragedy comes opportunity! Paradise would like to be a model for not only how the land and people can recover, but how to rebuild in balance with nature, and with resilience for the new climate realities of drought, fire, and flood that are facing all communities in California. Join us for an evening in support of the Camp Fire Ecosystem Restoration Project, and the very first Ecosystem Restoration Camp to be located in the USA. Come learn from the community of Paradise's experiences, and the innovative ideas they have for a different way of responding to tragedy, including an upcoming Paradise Camp Fire Restoration Weekend event April 26-28. Many lessons from the Ecosystem Restoration Camp global movement will be incorporated and shared. The free Santa Barbara evening event will include film, discussion, pizza & drinks. Matthew Trumm of Treetop Permaculture and coordinator for the Camp Fire Restoration Project, will be available via ZOOM to share and answer questions. Santa Barbara resident Art Ludwig of Oasis Designs will share film shorts on fire & earthquake resistant housing, debris flow protection, stormwater capture, and designs for sustainable & affordable housing that he is currently working on. 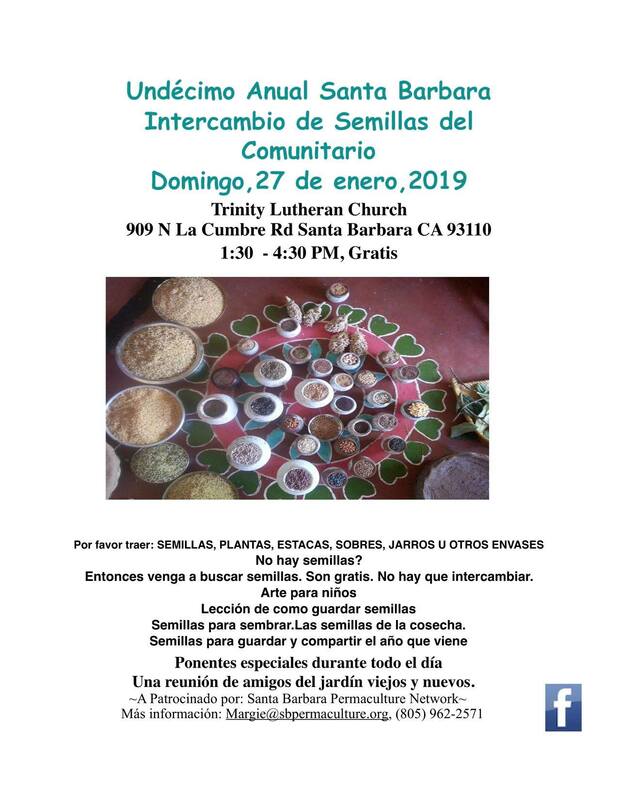 A community event hosted by the Santa Barbara Permaculture Network and Abundant Earth Foundation. 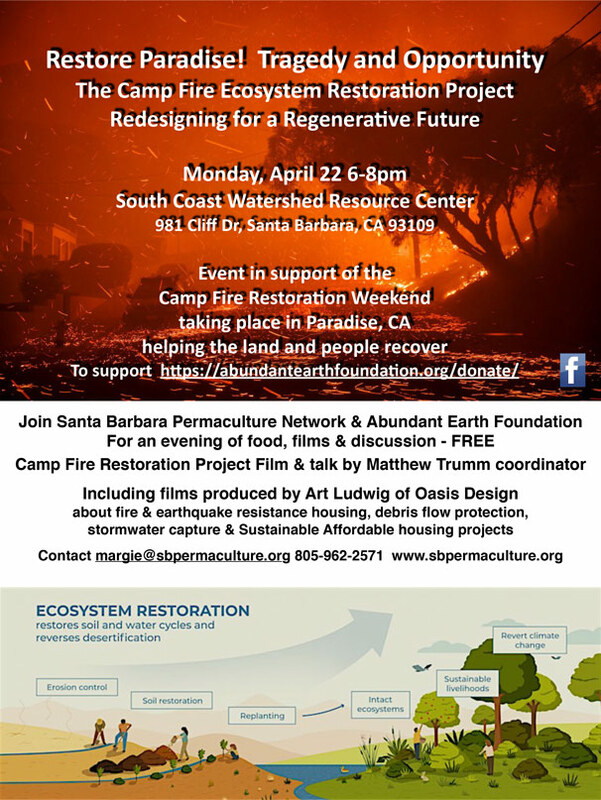 Camp Fire Restoration Weekend, April 26–28, 2019: An opportunity to come together in Paradise, CA, for an educational experience in regenerative design, ecological restoration, community organizing and permaculture gardening. We'll gather as a community to learn by doing. Watch the promo film, or support the project by registering to attend or making a donation. Ecosystem Restoration Camps: A grassroots non-profit organization engaging people to transform damaged landscapes into thriving, biodiverse ecosystems, founded in response to a groundswell of support from people worldwide who see the amazing potential of soil restoration. UN Decade on Ecosystem Restoration: Announced on March 1, 2019, the UN Decade on Ecosystem Restoration offers unparalleled opportunity for job creation, food security and addressing climate change. 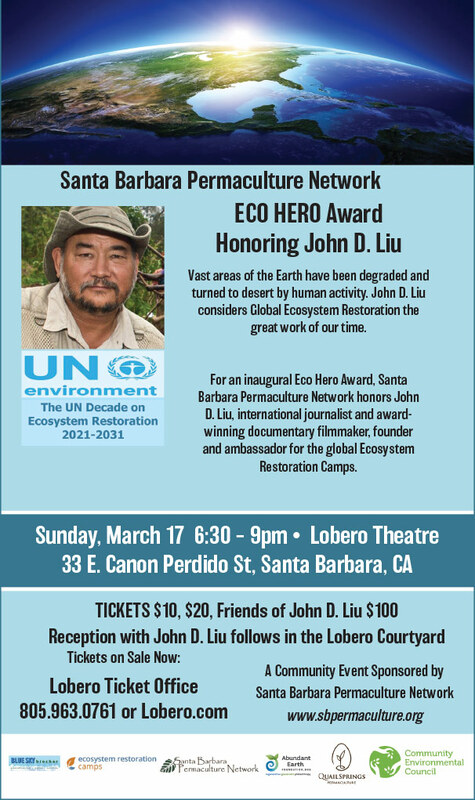 Join us for our first annual Eco Hero Award, honoring John D. Liu, international journalist, award-winning documentary filmmaker, soil scientist, founder and ambassador for the global network of Ecosystem Restoration Camps. John D. Liu considers Global Ecosystem Restoration the great work of our time. Vast areas of the Earth have been degraded and turned to desert by human activity over the millennia, causing drought, poverty, and releasing carbon into the atmosphere with bad soil practices. The U.N. currently estimates the Earth has almost 5 billion acres of deforested and degraded ecosystems, an area larger than the South American continent. As a young Chinese-American, Liu's early career started as a cameraman and journalist covering major geopolitical events. In 1995 he got an assignment to film the Loess Plateau, one of the driest and poorest regions in China, where the Chinese government and the local people of the region transformed a massive degraded area the size of Belgium into a verdant and productive green oasis. Stunned by what he saw and realizing that this ecosystem restoration model could be replicated around the world, Liu was inspired to become a soil scientist, and spent the next twenty years visiting more than eighty countries documenting similar large scale ecosystem restoration projects, eventually creating the award-winning What if We Change documentary and Hope in a Changing Climate film series. Broadcast on CBS, BBC, National Geographic and other outlets, these film series cover successful ecosystem restoration projects in Portugal, Jordan, China, Ethiopia, Sweden, Rwanda, Spain, Mongolia, Uganda, Australia and more. With his work and films John D. Liu shows what is possible for the Earth with ecosystem restoration, delivering a message of hope and inspiration. But Liu also feels the human species is at a crossroads, to survive or not survive as a civilization. Former cradles of civilization have failed by depleting their ecosystems, but for the first time, there is the potential of losing the planet as a home by disrupting all its functioning systems. Understanding how the ecological functions of our planet work is key to our survival, and Liu suggests healthy ecosystems are where all of our wealth actually comes from. Will we design economic and production systems from scarcity and ignorance, continually depleting and extracting, or from abundance, with new models that protect, enhance, and preserve ecosystems, working with nature to assist with what an evolving planet is always prepared to do, rehabilitate itself and flourish. Bringing this restoration vision into the 21st century, Liu and others launched the Ecosystem Restoration Camp movement, where he currently serves as Ambassador for the global Ecosystem Restoration Camp network. The Ecosystem Restoration camps are for youth and all ages to come together and learn practical hands on skills and effective strategies for restoring soil and water cycles, reversing desertification, and ultimately mitigating climate change. Camp Altiplano, the first ecosystem restoration camp, located in a large emerging desert in Spain, celebrated its first anniversary last summer. Other camps are in the works, including a camp in San Miguel de Allende, Mexico, and a developing site in Paradise, California, where devasting wildfires took place last Fall. After the Eco Hero award is presented, Liu will share personal stories about his experiences over the decades, and update the audience about the developing Ecosystem Restoration camps and how others might get involved. A reception follows in the Lobero Courtyard, where all are welcome to meet and converse with Liu. Santa Barbara Permaculture Network will also recognize individuals and groups doing regenerative and ecosystem restoration work in the Santa Barbara and Southern California area. 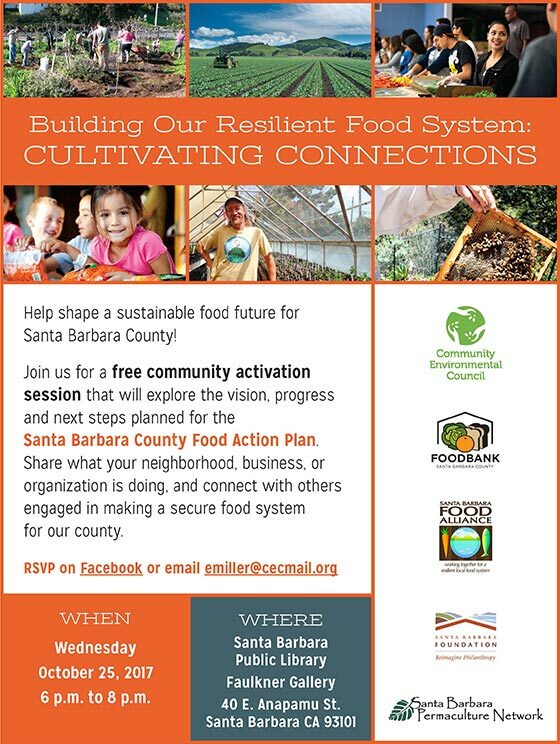 A community program hosted by Santa Barbara Permaculture Network. Co-Sponsored by the Community Environmental Council (CEC), Blue Sky Biochar, Abundant Earth Foundation, Quail Springs Permaculture, and the Santa Barbara Independent. John D. Liu is the founder of the Environmental Education Media Project (EEMP); Senior Research Fellow with the International Union for Conservation of Nature (IUCN); Visiting Fellow with the Critical Zone Hydrology Group, Faculty of Earth and Life Sciences at the Vrije University Amsterdam; Chairman of the Advisory Board for the Ecosystem Restoration Camps Foundation; and Ecosystem Ambassador for the Commonland Foundation. Videos: What if We Change documentary and Hope in a Changing Climate film series on YouTube. Interview: Interview with John D. Liu/Hope & Ecosystem Restoration Camps on YouTube. Price: $10 at the door; full-time students free (with current ID). No reservations required. Technology has provided humans with an unparalleled standard of living, but in the process has left a severely degraded and contaminated environment in need of recovery. With the health of our land, waterways, oceans, and human health at risk, how do we navigate out of these toxic times, both our past legacy, and what we will face in the future. 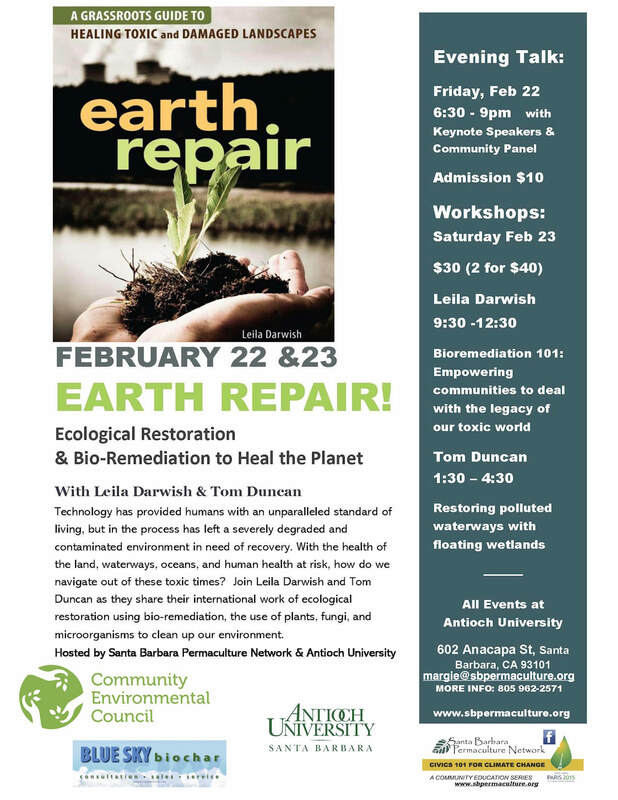 Join Santa Barbara Permaculture Network as we host Leila Darwish and Tom Duncan for a two day event as they share their international work and expertise with ecological restoration using bio-remediation, a process of detoxifying and restoring the land and water by working with plants, fungi and micro-organisms. Our keynote speakers will discuss their work with Bioremediation and Ecological Restoration in local communities and internationally to help solve the toxic legacy that impacts our environment. Followed by a community panel moderated by Paul Relis. The workshop will cover the how to's for microbial remediation (bacteria), phytoremediation (plants) and mycoremediation (fungi). It will also share important self-care practices (both herbal supports and protective gear) for earth repair practitioners working and living in contaminated environments. Finally, we will brainstorm ways to use bioremediation rooted in earth care and solid community organizing to support frontline communities responding to natural and environmental disasters, from the aftermath of wildfires to oil spills. What are manmade floating wetlands and islands used for? How are they constructed, and with what materials? Are they good for both small home and urban gardens, but also large scale farming? What developments are taking place around the world with floating island and wetlands technologies that might help Climate Change? Can we bio-mimic nature's wetlands to effectively clean up our environment? Join Tom Duncan, founder of AquaBiofilter™ Floating Wetlands & Island technology, as he shares his years of experience and expertise designing wetlands systems large and small, for cleaning up toxicity, growing food, and providing enhanced wildlife habitat, both above and below the waterline. We will explore case studies, technology, and share ideas on wetland project implementation in catchments. Also conversation about new ways for raising funds to restore the commons. This is an amazing opportunity to learn from one of the most experienced people in this field—please bring your questions! 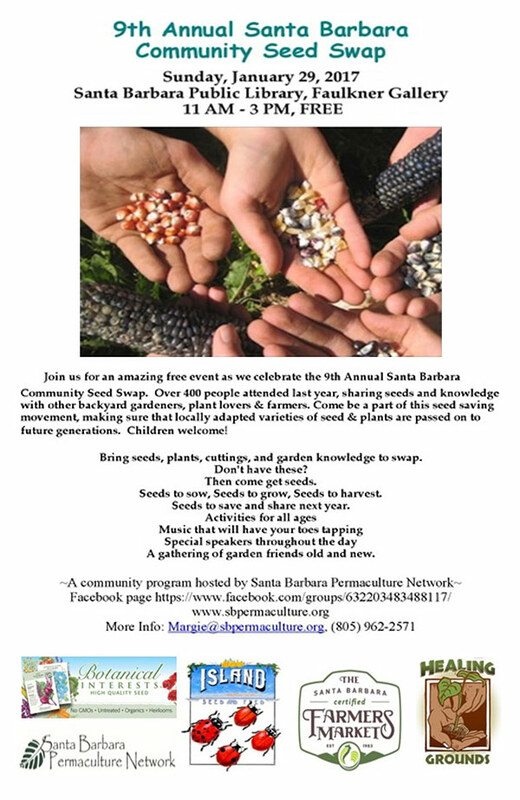 A community program hosted by Santa Barbara Permaculture Network. Part of the Santa Barbara Permaculture Network Civics 101 for Climate Change series. Co-Sponsored by Antioch University, Community Environmental Council (CEC), Blue Sky Biochar, and the Santa Barbara Independent. Leila Darwish is a community organizer, author, bioremediation educator, permaculture designer, and disaster recovery worker with a deep commitment to providing accessible and transformative tools for communities dealing with the toxic contamination of their lands and waters, and responding to natural and environmental disasters. Her original focus was on oil spills, as she came from the tar sands region in Alberta, Canada. Shocked by how ill-prepared both government and oil companies were for cleaning up oil spills, Leila was prompted to educate herself with a deep dive into the world of bioremediation. With a mission to empower citizens and communities to organize, scale up, and respond effectively to all kinds of industrial disasters where dangerous chemicals are released into the air, water and soil, she embarked on a career as a grassroots bioremediation educator and consultant. In 2013, Leila published her first book, Earth Repair: A Grassroots Guide to Healing Toxic and Damaged Landscapes. Her work is rooted in environmental and social justice, inspired by the power of community action and regenerative earth repair. She wants all citizens, especially those in the most vulnerable communities, to have the knowledge and skills needed to protect their families and homes from exposure to harmful toxins. She has taught numerous bioremediation and oil spill response courses in communities across North America. She has a Masters of Disaster Resilience Leadership from Tulane University in New Orleans. Her Earth Repair book will be available for purchase at all events. Learn more about Leila and her work. Tom Duncan is an entrepreneur devoted to the health of the planet, who has been building aquaponics systems in small and large scale aquaculture systems across Australia and China for almost twenty years. Tom invented the AquaBiofilter™ Floating Wetlands & Floating Island technology to clean up polluted lakes, water bodies, rivers and estuaries. With all kinds of pollutants entering our waterways, including urban runoff, stormwater sediments, heavy metals from industry, and agricultural pesticides and fertilizers causing deadly algal bloom, these floating wetlands help restore ecological function by filtering and purifying with the use of microbes and plants. In 2004, Duncan and a team of scientists demonstrated that polluted lakes across Asia could be completely restored, while also preventing future toxic algal blooms. He proved in the field and through quantitative modeling that dedicating just 1% of farm and urban catchments to floating wetland ponds would eliminate toxic algae blooms in lakes, rivers and estuaries. Floating wetlands remove nutrients, suspended solids and pollutants, mopping up impurities and releasing clean water to rivers and oceans. In addition to cleaning the water, floating islands optimize habitat for wildlife, and provide additional areas for food production for growing populations. Tom served as Chairman of the Green Building Council of Australia for two years, developing the new Green Building Rating Tool. He is also the founder of Liquid Token, a fintech platform for impact assets and natural capital. He has experience across sectors including environmental technology and large scale restoration, investment and finance, technology and policy. Learn more about Tom's work & projects. Paul Relis is cofounder of the Santa Barbara Community Environmental Council (CEC) and Senior Vice President of CR&R Environmental Services, leaders in Anaerobic Digestion (AD), converting organic waste to 100% Renewable Natural Gas. 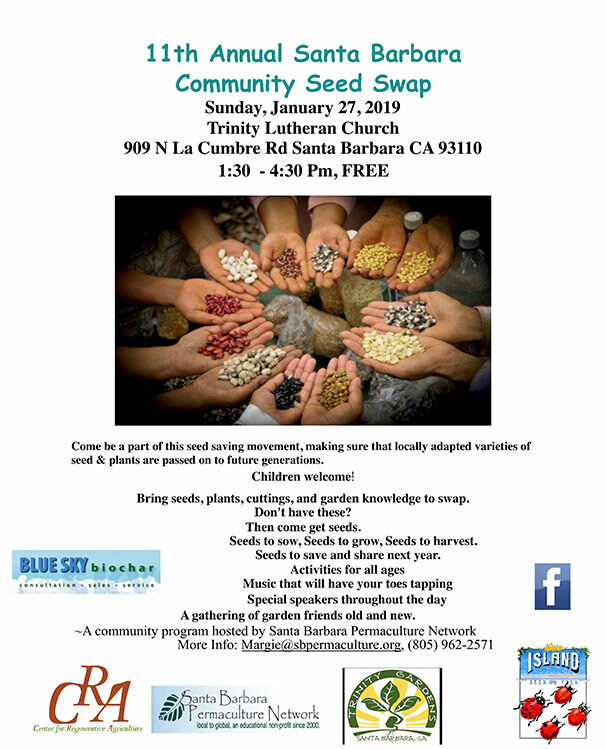 Join us for the 11th Annual Santa Barbara Community Seed Swap at Trinity Gardens!. Hundreds attend this free event every year, sharing seeds and knowledge with other backyard gardeners, plant lovers, beekeepers, farmers and more. Come be a part of this seed-saving movement, making sure that locally adapted seeds & plants are passed on to future generations. Indoor & outdoor activities, special speakers, children activities, food & live music! Local groups will have plant and seed-related exhibits. Speaker topics this year include: Seed Saving 101, the Maya Forest Garden, Bee City USA, Compost Tea & Biology of the Rhizosphere, Building Living Soils with Biochar, Sacred Seeds of the Peruvian Andes, Building Beneficial Insect Habitat, and more. Seed saving is a fun and easy way to connect to the circle of life! Don't have these? Then come get seeds. Seeds to sow, seeds to grow, seeds to harvest. Seeds to save and share next year. Music that will have your toes tapping. Special speakers throughout the day. 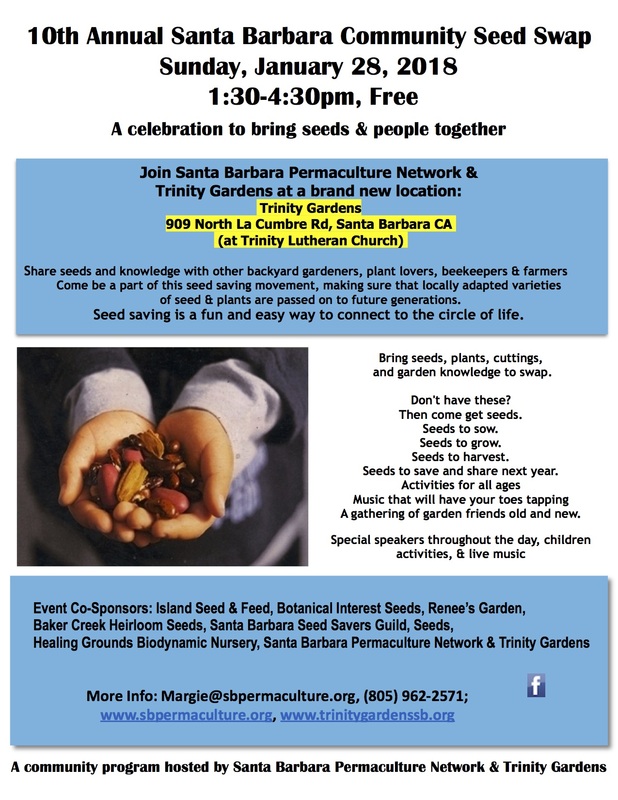 A community program hosted by Santa Barbara Permaculture Network & Trinity Gardens. Co-Sponsored by Island Seed & Feed, Blue Sky Biochar, Healing Grounds Biodynamic Nursery, and Ojai Center for Regenerative Agriculture. Once again we will be honoring a Local Food Hero at the Seed Swap! 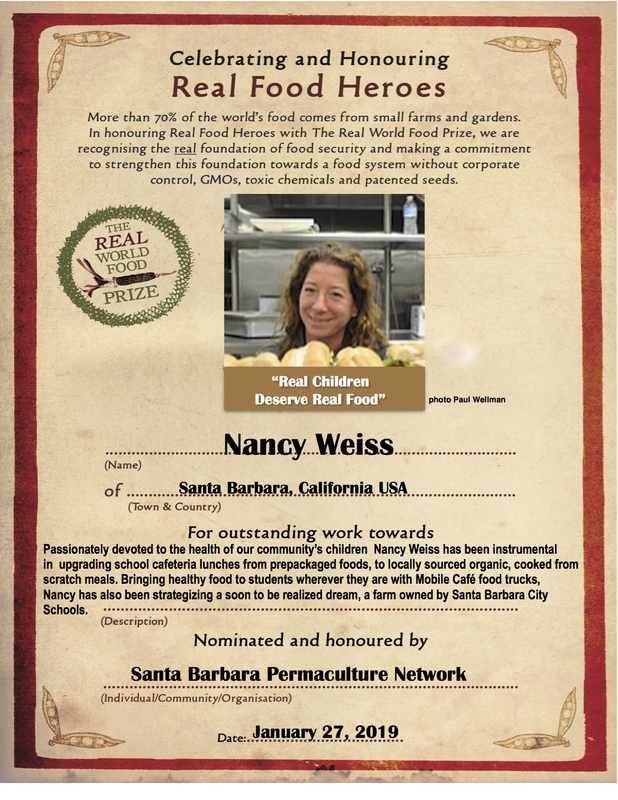 This year the award goes to Nancy Weiss, Director of Food Services for the Santa Barbara Unified School District. Passionately devoted to the health of our community's children, Nancy has been instrumental in upgrading school cafeteria lunches from prepackaged, highly processed foods, to high quality, cooked from scratch meals, from locally sourced organic growers. Bringing healthy food to students wherever they are, Nancy incorporated Mobile Café food trucks to go where needed, especially near high school campuses. Helping students learn not only about eating healthy food, but also growing it, Nancy partnered with Explore Ecology to initiate the unique Farm to Toast program where wheat is being grown at school gardens. Nancy's vision for the future includes a soon to be realized dream, a farm owned by Santa Barbara County Schools. Nancy's motto is "Real Children deserve Real Food." Help us continue to shape a sustainable food future for Santa Barbara County! 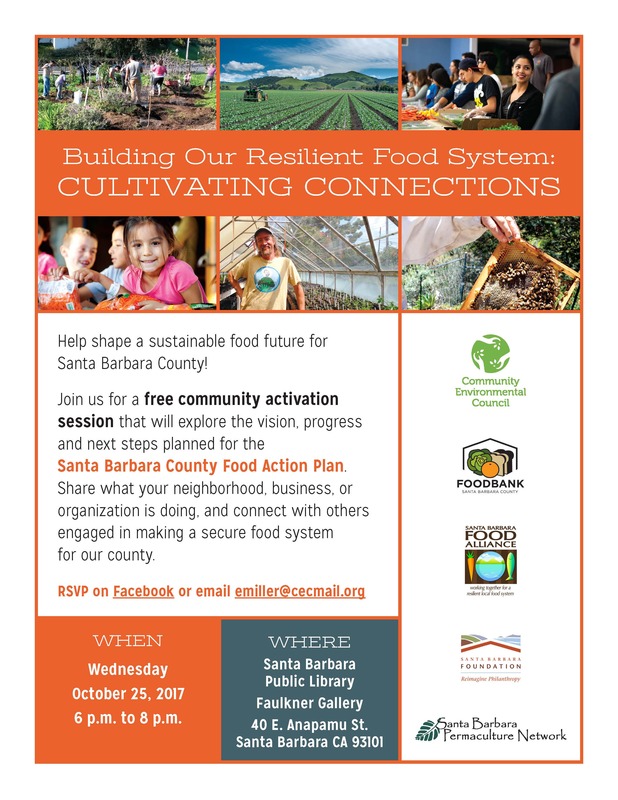 Join us for the second annual free community listening and activation session for the Santa Barbara County Food Action Plan. Attendees–including individuals, businesses, schools, and organizations of all types, will once again be encouraged to inform the process by sharing about their own regional work to create a more secure, sustainable food system. A networking session will provide time to seek out new partnerships and opportunities to support each other. The event is organized by the Community Environmental Council, the Foodbank of Santa Barbara County, and the Santa Barbara Foundation. 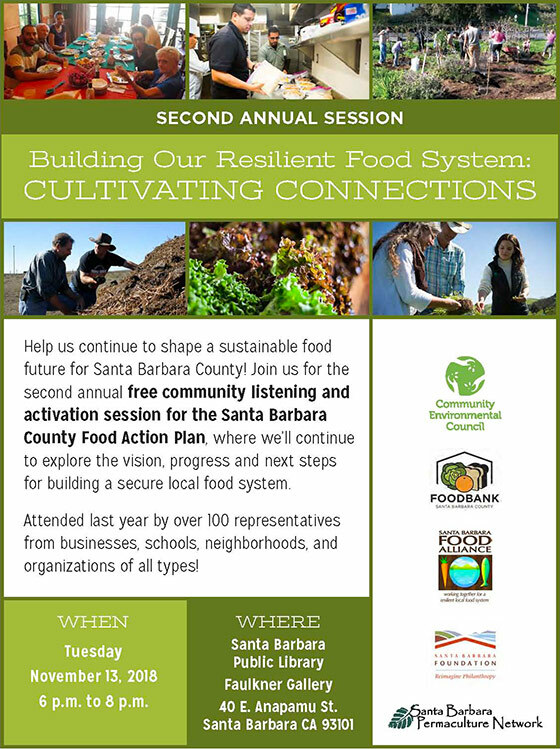 Co-sponsors are Santa Barbara Food Alliance and the Santa Barbara Permaculture Network. The Santa Barbara County Food Action Plan is a community-driven strategic plan that assesses and provides recommendations for how we grow, distribute, consume, and dispose of food. The Foodbank of Santa Barbara County and the Community Environmental Council spearheaded the project, with major support from the Santa Barbara Foundation. Community gatherings are an essential component of the Food Action Plan, which is designed to create a more resilient food system that supports a healthy economy, healthy people, and a healthy environment. 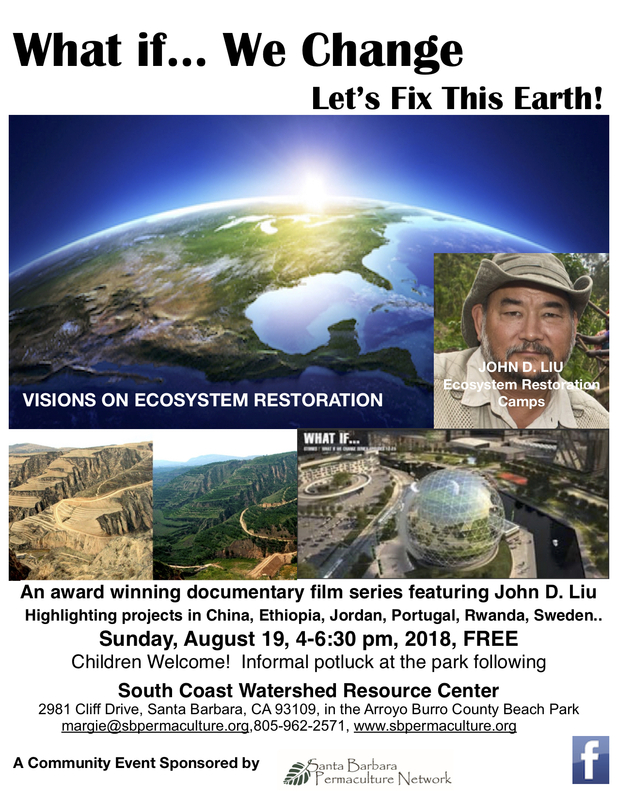 Join Santa Barbara Permaculture Network for an award-winning documentary film series featuring John D. Liu highlighting ecosystem restoration projects around the world. It all started in 1995 when John D. Liu, an award-winning journalist and cameraman working for CBS News, got an assignment to film the Loess Plateau in China, one of the poorest regions in the country. He observed how the local Chinese people had transformed a massive degraded area the size of Belgium, damaged from centuries of agriculture and grazing, into a verdant and productive green oasis. Liu was stunned by what he saw and, and with the realization this ecosystem restoration model could be replicated all over the world, was inspired to become a soil scientist. Of course there was a message to be shared, so as a talented storyteller and filmmaker, Liu spent the next 30 years documenting large scale ecosystem restoration projects around the globe, eventually creating the award-winning What if…We Change documentary series. The series covers restoration projects in Portugal, China, Ethiopia, Sweden, Rwanda, Spain, Mongolia, Uganda, Australia and more. Because Liu considers Global Ecosystem Restoration the great work of our time, he launched Ecosystem Restoration Camps, a grassroots NGO that engages people of all ages to come and live for an extended time and help transform damaged landscapes into thriving, biodiverse ecosystems. The first camp was located in the Spanish Altiplano region, where one of the largest dryland deserts is rapidly emerging, threatening the environmental health of Europe. In an era when the world and our own Santa Barbara community is facing daunting environmental challenges, with droughts, fires, floods, and an increasingly erratic climate—we know innovative solutions are needed. Santa Barbara Permaculture Network is excited to have John D. Liu join us online LIVE via ZOOM platform at the event where we can explore some of the similarities of his work and Permaculture. Please bring your ideas and questions for John, so together, with all our hearts and minds, we can help fix this earth! John D. Liu is a soil scientist and an American filmmaker who has lived in China for over 30 years. His early career with CBS News as a producer and cameraman had him covering major geopolitical events of the time, but after an assignment covering the Loess Plateau Watershed Rehabilitation Project, he became an ecological filmmaker, founding the Environmental Education Media Project. In addition to the What if We Change documentary, Liu's other films include Hope in a Changing Climate; Rwanda, Forests of Hope; and Green Gold. He also wrote and produced Jane Goodall: China Diary for National Geographic. Liu is Senior Research Fellow with the International Union for Conservation of Nature (IUCN), and Visiting Fellow with the Critical Zone Hydrology Group; Faculty of Earth and Life Sciences at the Vrije University Amsterdam. Liu is Chairman of the Advisory Board for the Ecosystem Camps Foundation, and currently serves as Ecosystem Ambassador for the Commonland Foundation. No reservation are required. Bring a brown bag lunch or favorite potluck dish for an informal outdoor picnic and time for conversation following the event. Children welcome! Sponsored by Santa Barbara Permaculture Network. Ecosystem Restoration Camps: a grassroots non-profit organization that is engaging people to transform damaged landscapes into thriving, biodiverse ecosystems, founded in response to a groundswell of support from people worldwide who see the amazing potential of soil restoration. Please join us for the 2018 International Permaculture Day in Santa Barbara. 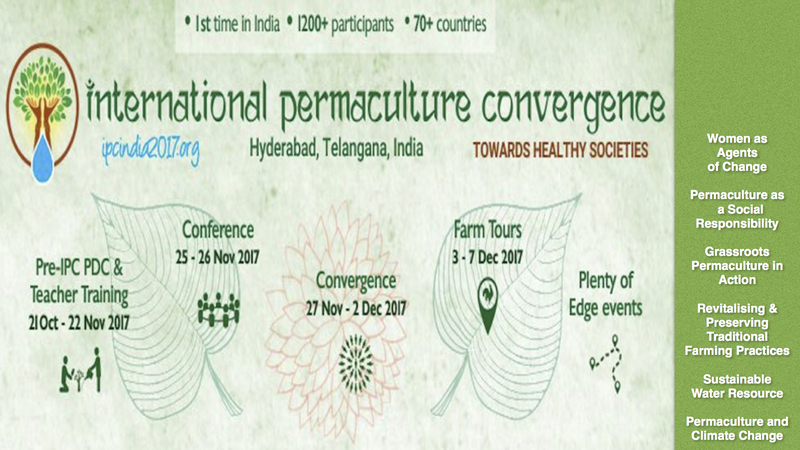 We will celebrate by sharing our recent experiences at the International Permaculture Conference & Convergence (IPC) in India, what could be more appropriate? Over 1000 participants from more than 60 countries attended. Once again participants had a chance to experience another culture in a way that seldom happens with ordinary tourist travel. We will give a short talk, show an IPC India video, with time for questions, then go outdoors to picnic on the park lawn with Indian food appetizers. Our hosts for IPC India, Padma & Narsanna Koppula of Aranya Agricultural Alternatives, did a magnificent job bringing attendees & speakers from all parts of India, including women farmers, who were kind of rock stars at the event! Women as Agents of Change was a subtheme for IPC India, accomplished with the women farmers who attended in large numbers, and it highlighted the dedication of Aranya Agriculture Alternative, this work, their mission for over 20 years. And IPC India heroes, a team of extraordinary volunteers who came from around the world to help with IPC India, some staying for an entire year. Learn about the grassroots permaculture global community crowdfund that raised $10,000 for attendees who wouldn't have been able to come otherwise, organized by the Friends of the International Permaculture Convergences (FIPC), of which we are members. This IPC event had special meaning, as it was the 30th anniversary of Permaculture coming to India with Bill Mollison, and team teaching the first PDC with Robyn Francis in 1987. This will be both an indoor & outdoor event at the South Coast Watershed Center at the Arroyo Burro (Hendry's) County Park. No reservation needed. Bring a brown bag lunch or favorite Indian potluck dish/appetizers for an informal picnic outdoors. Children welcome! $20: Friends of Film & Farm Community ticket. Helps support free guest passes for community farmers. Includes reserved seating front of auditorium. 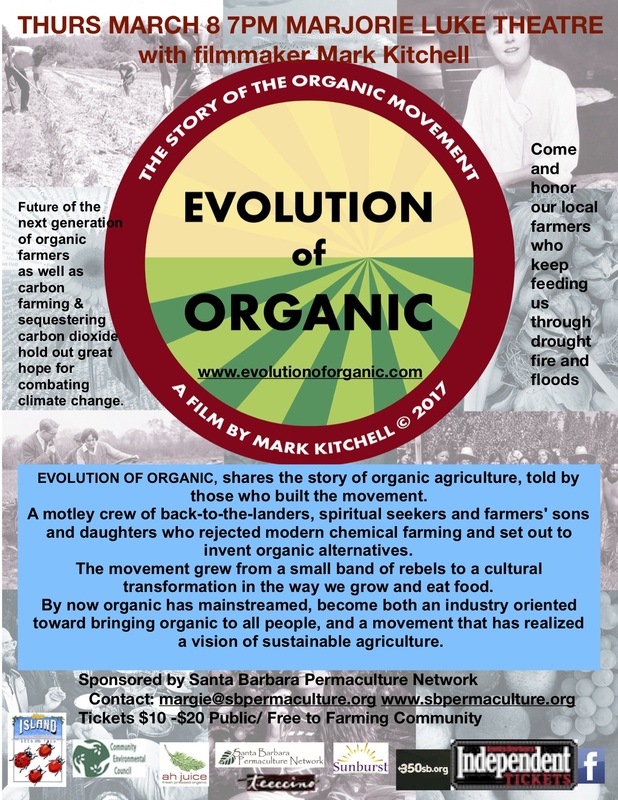 Among all the films on food and farming, Evolution of Organic is the first to tell the story of the organic movement. How it started, who the people were who bravely initiated it, and how it literally changed the way we eat food. Mark Kitchell is an acclaimed filmmaker interested in the social movements of our time that shift culture. It was no accident that California, home of the world's most industrialized agriculture, also gave rise to its opposite—organic agriculture. The ‘60s counter-culture headed back to the land, determined to grow safe and healthy food. Few had any farming experience; but they experiment and learn and in time become good farmers. In addition to Evolution of Organic, Kitchell's earlier films include the iconic Berkeley in the Sixties, which was nominated for an Academy Award; and Fierce Green Fire, an exploration of environmental activism from conservation to present day climate change issues. Kitchell will be in attendance for questions and discussion at the event. Invited as guests to be honored at the film premiere will be organic growers and farmers from the Santa Barbara region, many who were instrumental in launching the organic movement. After the film will be time for discussion about the future of organics, who the emerging farmers are in our area, and what assistance is needed for their success. We will also take a moment of gratitude for all our local farmers who kept growing and going on our behalf during the fire & flood events in recent weeks. 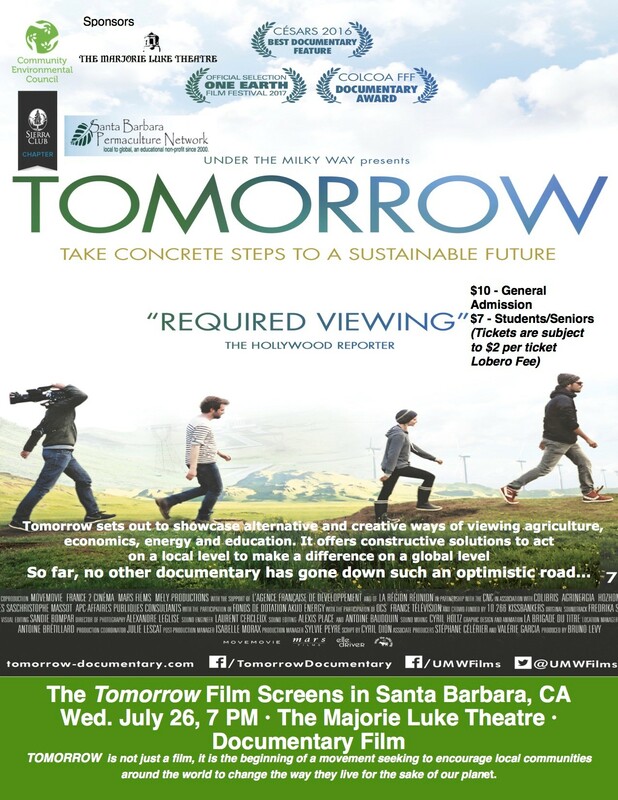 A community program hosted by Santa Barbara Permaculture Network & Marjorie Luke Theatre. Co-Sponsored by Community Environmental Council (CEC), Santa Barbara Independent, Island Seed & Feed, Ah Juice Organics, 350 Santa Barbara, & Teeccino. 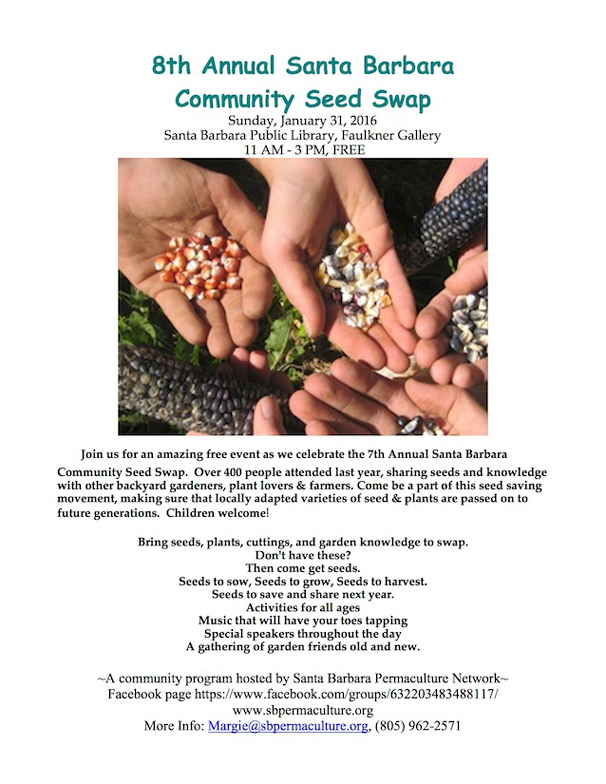 Join us for the 10th Annual Santa Barbara Community Seed Swap at a brand new location! This year at the beautiful Trinity Gardens, with both indoor and outdoor space, for lots of seed sharing activities, children welcome. Hundreds attend every year, sharing seeds and knowledge with other backyard gardeners, plant lovers, beekeepers and farmers. Come be a part of this seed-saving movement, making sure that locally adapted seed & plants are passed on to future generations. Special speakers, children activities & live music! Local groups will have plant and seed related exhibits. Many sharing valuable seed saving techniques that encourage local gardeners to grow out and harvest some of their best seeds for future gardens and seed swaps, making us a truly food secure community. Seed-saving is a fun and easy way to connect to the circle of life. Co-Sponsored by Island Seed & Feed, Botanical Interests, Santa Barbara Seed Savers Guild, Baker Creek Heirloom Seeds, Renee's Garden Seeds, and Healing Grounds Biodynamic Nursery. Once again we will be honoring a Local Food & Plant Hero at the Seed Swap. 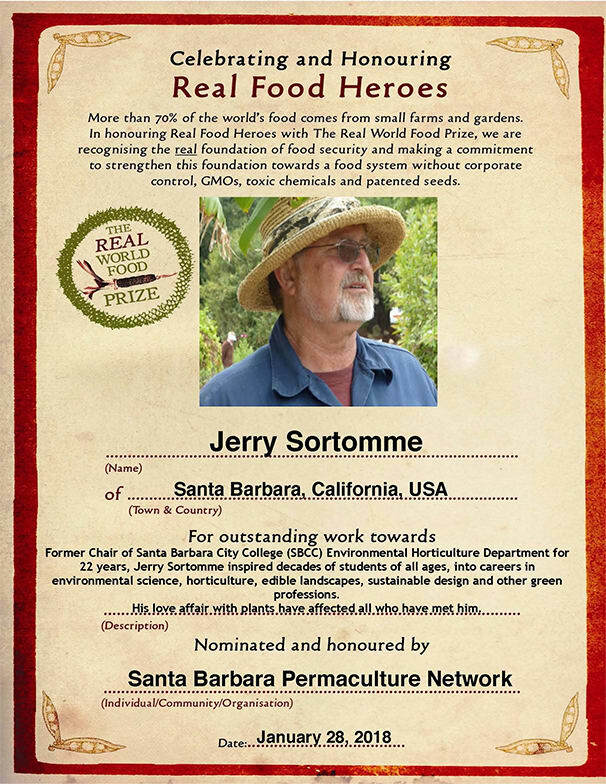 This year the award goes to Jerry Sortomme, former Chair of the Santa Barbara City College (SBCC) Environmental Horticulture Department, whose love affair with plants has affected all who have met him, inspiring students of all ages for many decades. His SBCC students, dubbed "Jerry's kids," went on to careers in environmental science, horticulture, edible landscapes, sustainable design and other green professions. Have you been to the SBCC Lifescape garden? The La Huerta Historic Garden at the Old Mission? Yup, those and more were inspired and launched by Jerry Sortomme. Please join us in honoring this local food hero. Learn more on our Facebook group page. These two disparate things—reducing my own fossil fuel use and increasing my ability to love—are actually intimately connected. There is no separation between me and the rest of the life on this planet. 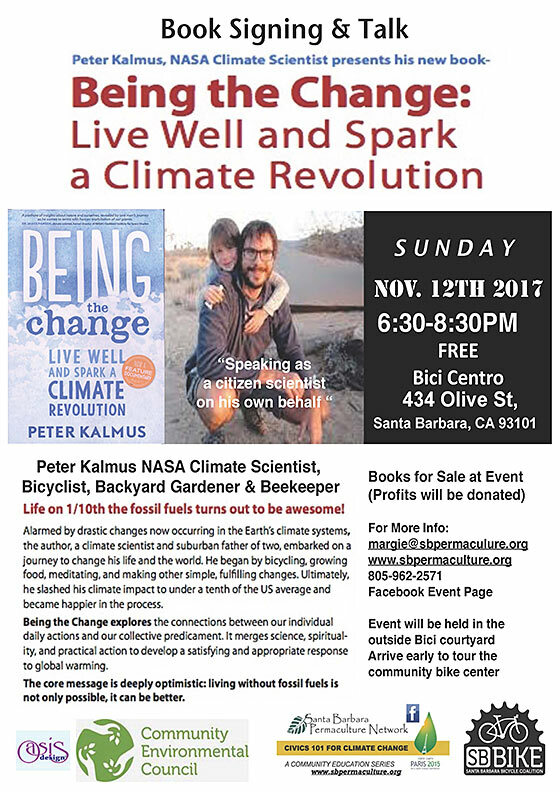 Join Santa Barbara Permaculture Network as we host Peter Kalmus, author of the newly published book Be the Change; Live Well & Spark a Climate Revolution. 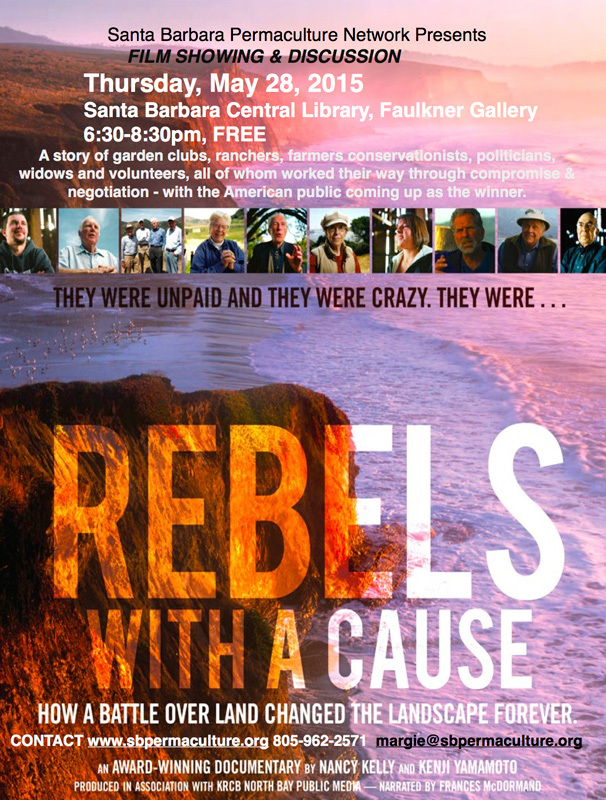 Special guest Paul Relis, co-founder of the Community Environmental Council (CEC) after the devastating oil spill in the Santa Barbara Channel in 1969, will introduce Peter, linking two generations of committed and passionate citizen activists. Alarmed by drastic changes now occurring in the Earth's climate systems, Kalmus, a climate scientist and suburban father of two, embarked on a journey to change his life and the world. He began bicycling, growing his own food, meditating, and making other simple, fulfilling changes. Ultimately, he slashed his climate impact to under a tenth of the US average, and became happier in the process. Being the Change explores the connections between our individual daily actions and our collective predicament. It merges science, spirituality, and practical action to develop a satisfying and appropriate response to global warming. The core message to his book is deeply optimistic: living without fossil fuels is not only possible, it can be BETTER. Peter Kalmus is an atmospheric scientist at NASA's Jet Propulsion Laboratory with a Ph.D. in physics from Columbia University, and a BA in Physics from Harvard, maintaining clearly in his book and talks, he is speaking on his own behalf, not representing any of the scientific agencies he works for, or institutions where he studied. Kalmus is a contributing editor and columnist for YES! Magazine. Please come early to explore the community bike center. Books will be available to purchase, author donating profits. Part of the Santa Barbara Permaculture Network CIVICS 101 FOR CLIMATE CHANGE, A Community Education Series. Book: Being the Change: Live Well & Spark a Climate Revolution, published by New Society Publishers. 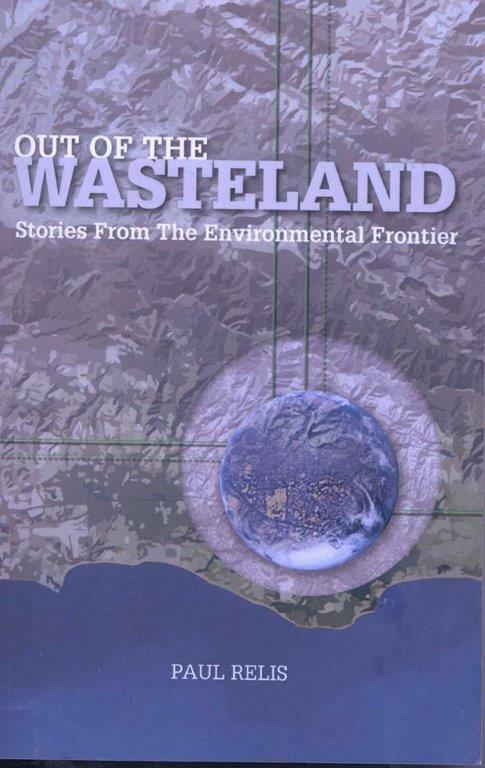 Website: Paul Relis, author of Out of the Wasteland: Stories from the Environmental Frontier. Article: To My Fellow Climate Scientists: Be Human, Be Brave, Speak Truth. By Peter Kalmus in YES Magazine. Profile: Peter Kalmus: a scientist pioneers a low carbon Lifestyle in Altadena CA in City Atlas New York. Article: How one American family has moved away from fossil fuels. "Being the Change" is proof that weaning oneself off fossil fuels is not only possible, but also joyful and fun for a young suburban family. Article: Who Owns the Future of California's Energy? Its Residents. How California Could Get to 100 Percent Renewable Energy. By Peter Kalmus in YES Magazine. Interview: Climate Change and Be-cycling with Peter Kalmus on RootSimple.com. 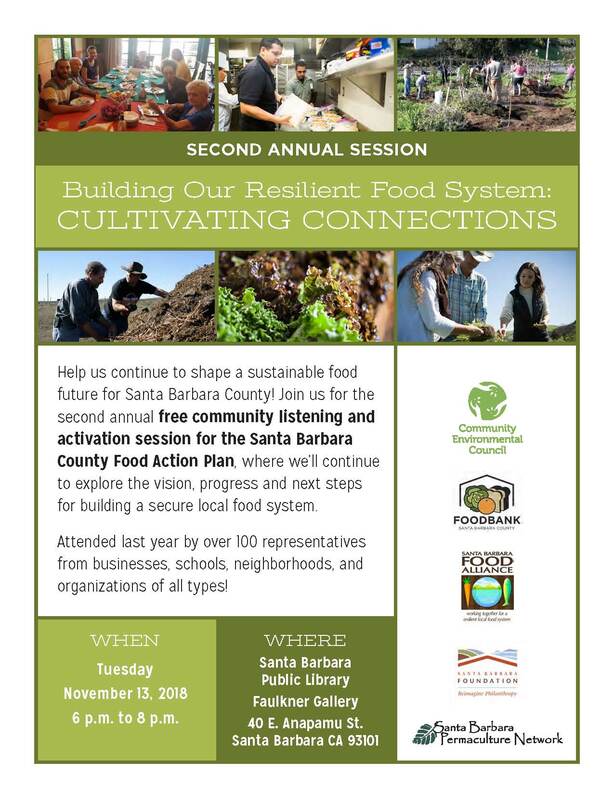 Building Our Resilient Food System: Cultivating Connections is a free community listening and activation session that will explore the vision, progress and next steps planned for the Santa Barbara County Food Action Plan. We invite you to share what your neighborhood, business, or organization is doing, and connect with others engaged in making a secure food system for our county. Community members will hear about the goals of the plan and learn about successes from the organizations and individuals actively pursuing these goals. Attendees, including individuals, businesses, schools, and organizations of all types, will also be encouraged to inform the process by sharing about their own regional work to create a more secure, sustainable food system. A networking session will provide time to seek out new partnerships and opportunities to support each other. Download the SBC Food Action Plan (PDF). The SANTA BARBARA COUNTY FOOD ACTION PLAN is a strategy-based community “blueprint” for an accessible, thriving, sustainable, and healthy food system. It addresses every aspect of the food system in a way that supports healthy people, a healthy economy, and a healthy environment. What is a Food Action Plan? A food action plan is a community-driven strategic plan that assesses how we grow, distribute, consume, and dispose of food. While each community tailors the plan to their specific needs, most share two common elements: they capture the aspirations of the community around food and farming, and they identify concrete things that can be done to improve the policies, programs, and individual actions that shape how food moves from farm to plate. What is a Food System? The food system encompasses how food moves from farms to tables. It includes farmers and the farmland on which food is grown, manufacturers and processors, distributors—from truckers to grocery stores to food banks—and all residents as consumers. It also incorporates the inputs needed and outputs generated at each step, including food waste. There are no defined geographical boundaries of our food system, but for the purposes of this plan, we localize the system to be Santa Barbara County. I've focused my energies on translating the information I've found into forms that everyone, especially children, youth, and families, can learn, understand, and use permaculture in their daily lives. 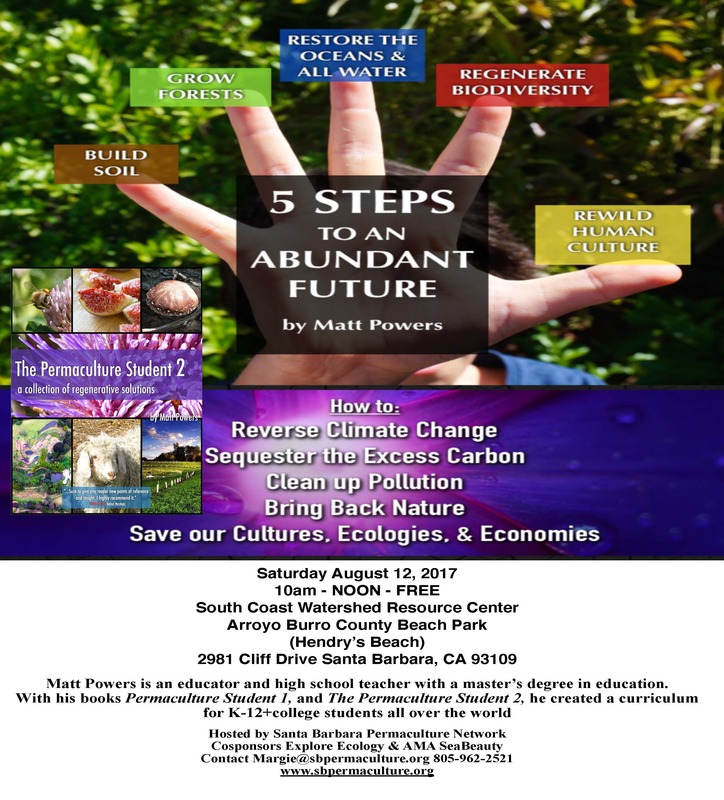 Join us on Saturday, August 12, as we host a morning talk with ecological designer, educator, and author Matt Powers, as he shares his 5 Steps to An Abundant Future that he suggests are needed to guarantee an abundant future for humans and the planet. Seeing Permaculture as a powerful tool, Powers wants Permaculture to become a household word, that ultimately finds its way into households and communities everywhere. A design science that uses the patterns and systems of nature to provide sustainably and regeneratively for both humans and the environment, Permaculture solves all the insurmountable problems of our modern world. Loss of topsoil, deforestation, and pollution, can all be addressed and reversed and regeneration can be achieved, as documented in a multitude of Permaculture projects around the world. The good news is that with these 5 steps, we can begin to reverse climate change, sequester excess carbon, clean up gnarly pollution in the air, water and soil, and bring back nature—all with the whole systems thinking of Permaculture. According to Matt, Permaculture is, in the simplest of terms, a way of seeing the world through nature's eye, a lens through which to view the world based on three ethics Earth Care, People Care, and Care of the Future. This requires constant observation and adaptation as nature is constantly changing. Permaculture is action-oriented: it provides a framework for ecological and sustainable problem solving and design. It can be applied to anything because everything is sourced in nature, its patterns and its cycles. The way cites are designed, food is grown, homes are heated and communities interact can all be redesigned using permaculture lens to be sustainable, ethical and regenerative. Matt will also be sharing his recently published book The Permaculture Student 2 for students, teachers, families, and learners, which is designed as a year-long curriculum filled with projects, activities, and formulas combined into one easy-to-understand volume. With up-to-date information, the book provides a holistic and comprehensive exploration of the philosophy of permaculture. Matt Powers is an educator and high school teacher with a master's degree in education. A true Renaissance man, he is also a professional musician and song writer, a plant breeder, seed saver, and gardener. 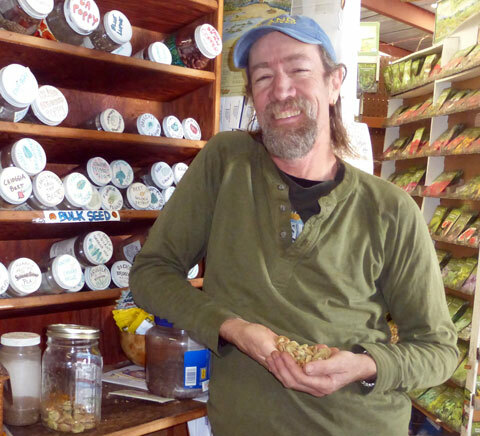 He is the resident horticultural and gardening expert at the Baker Creek Heirloom Seed Company. He has collaborated with leading global experts on soil, mycology, ecology, permaculture design, landscape restoration, regenerative farming, and alternative energy. With his books The Permaculture Student 1 and The Permaculture Student 2, he created a curriculum for K-12 and college students all over the world, with translations available in Spanish, Polish, and Arabic with French and Italian coming soon. Powers' own interest in Permaculture was inspired by a desire to live a better, healthier life for himself and his family, as a result of his wife's third bout with cancer. As he and his family began studying food, healthy living, and organic gardening, in this search, they ultimately discovered the positive, solutions-oriented philosophy of Permaculture. Brown bag with us! Stay around to picnic in the park following the talk. Lemonade, chips & dips provided, bring your own brown bag lunch. Children welcome. Co-Sponsored by Explore Ecology, Pharmersea & AMA SeaBeauty. Book: The Permaculture Student 2: A Collection of Regenerative Solutions, by Matt Powers. Article: The Permaculture Student 2: A Guidebook For The Future. Online courses: The Permaculture Student Online and Permaculture Gardening with Matt Powers. Podcasts: Permaculture Tonight, available on iTunes & SoundCloud. Matt's books will be available for purchase at the event. “Without question, TOMORROW is absolutely the best and most creative film on the future of humanity and the environment”. The Santa Barbara premier of a film directed & produced by Cyril Dion & Mélanie Laurent. Tomorrow won the Cesar award for best documentary, has been viewed by over a million people in France. The film has been released in over 30 countries, including the U.S. in April 2017. TODAY, we sometimes feel powerless in front of the various crises of our times. TODAY, we know that answers lie in a wide mobilization of the human race. Over the course of a century, our dream of progress commonly called “the American Dream”, fundamentally changed the way we live and continues to inspire many developing countries. We are now aware of the setbacks and limits of such development policies. We urgently need to focus our efforts on changing our dreams before something irreversible happens to our planet. TOMORROW is not just a film, it is the beginning of a movement seeking to encourage local communities around the world to change the way they live for the sake of our planet. Start small to grow big, and write a new story for the generations to come. Tomorrow: Tomorrow All Over the Globe, Solutions Already Exist. The companion book to the film, by Cyril Dion. Have you ever been to an International Permaculture Convergence (IPC)? They are epic, drawing the best & brightest permaculturists from around the world to help put together visionary solutions for a better world. For more than 40 years Permaculture has been leading the way with innovative, planet and climate friendly design strategies, that are just now being fully recognized by the rest of the world as the answer to some of our most pressing problems. Held every two years in different parts of the globe, the next IPC takes place in Hyderabad India, November 2017, hosted by Aranya Agricultural Alternatives. 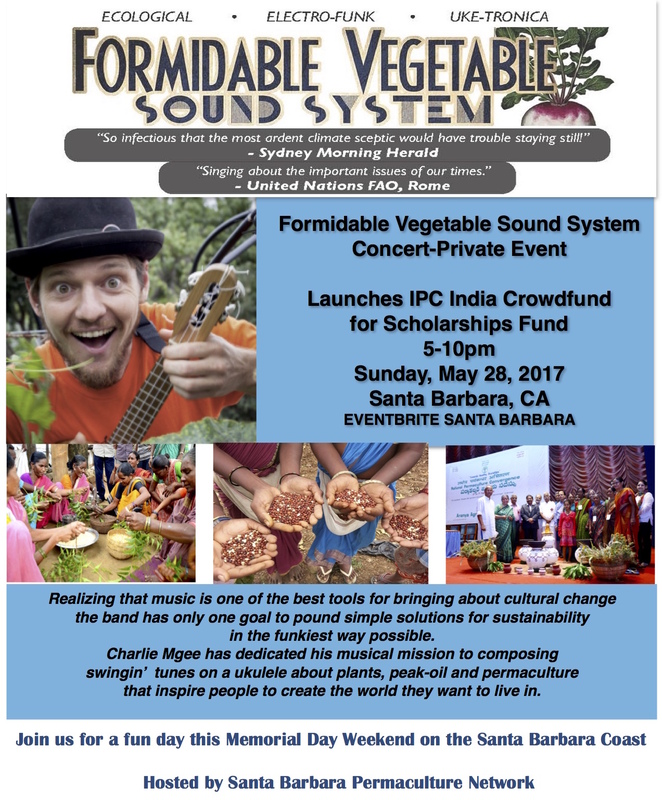 The Friends of the International Permaculture Convergences (FIPC) and Santa Barbara Permaculture Network are hosting a CROWDFUND campaign launch event in support of the IPC India scholarship fund on Sunday, May 28, with electro-funk, ecological electro-swing ukulele, super enthusiastic Charlie Mgee of the Formidable Vegetable Sound System band. Visiting from Australia, Charlie is currently on tour promoting his new CD. He has been to every corner of the globe, recognizing music as one of the best tools for bringing about cultural change, and has dedicated his musical mission to composing swingin' tunes on ukulele about Permaculture, sustainability and other ecological themes. In 2015, Charlie played for the opening night of the most recent International Permaculture Convergence (IPC UK) in London, England (see video below). Please join us for an evening of celebration, as we celebrate 20 years of Permaculture in our Southern California region, and India a 30 year Anniversary since Bill Mollison arrived to share the word of Permaculture on that continent! In addition to an evening of music, we will share information about IPC India and the exemplary work of the host organization, Aranya Agricultural Alternatives, and what others have been doing in India all through the years. All event ticket admissions go towards the crowdfund campaign, which is specifically for scholarships for IPC delegates from around the world, who may be skill rich, but many times coming from countries and regions that are cash poor. Forty-two delegates have applied so far. Please support generously with your dollars, the life & civilization they save may be your own! Beverages & appetizers will be offered, and a Food Cart with Indian themed food for purchase will also be available (please indicate when registering if interested in purchasing). Charlie's new CD will be available for sale, and the newest edition of the Permaculture Magazine North America, just off the press, will be available for a special event price. The event is invitation only, with directions provided after payment & registration. Parking is limited, please carpool! If you aren't able to attend, may still contribute to the FIPC scholarship crowdfund campaign for delegates wanting to attend IPC India. FIPC is a USA-based, fiscally sponsored nonprofit of Inquiring Systems Inc. All donations are tax deductible. More Fun: COMMUNTY LEARNING OPPORTUNITY: Precedes Concert 1 – 4:30pm. For those interested in coming earlier for more time outdoors, there will be a Hands-on Experiential Learning opportunity prior to the evening music, on a ranch that has been practicing & demonstrating regenerative and carbon farming practices for over 10 years. Bring gloves, hat, wear closed toe shoes, if you'd like to participate in some projects while learning a thing or two from the best (you must have concert ticket to participate). The story of permaculture in India, and the campaign to support both local Indian farmers (400!) by Aranya, and International delegates to attend with support of FIPC. If every farmer in the USA practiced Carbon Farming, in less than 10 years, we would sequester ALL the CARBON that has been emitted since the Industrial Age. As the climate crisis heats up, agriculture is in the hot seat, not only as a contributor to climate change, but also as a potential solution. Eric Toensmeier has spent the last several years tracking both, and put much of what he learned in his seminal book, The Carbon Farming Solution: A Global Toolkit of Perennial Crops and Regenerative Agriculture Practices for Climate Change Mitigation and Food Security. 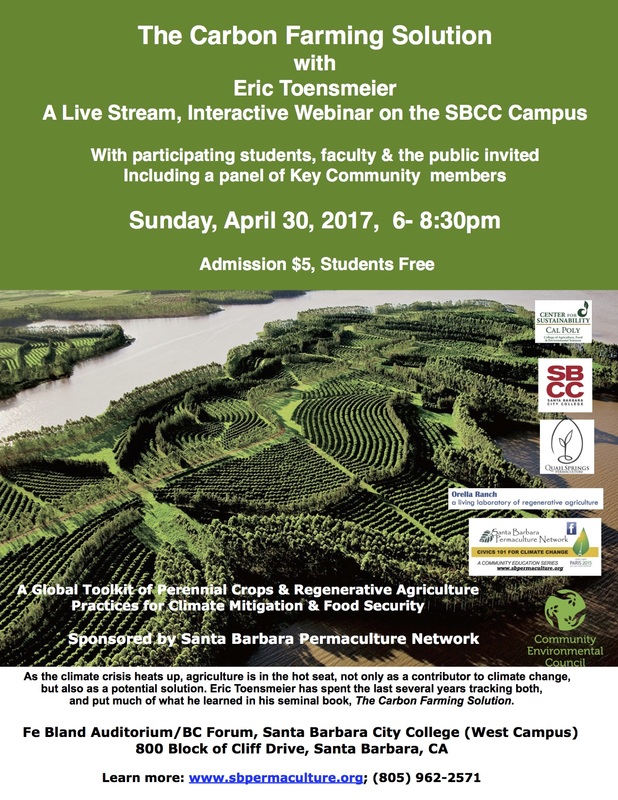 Join us for a unique live interactive webinar on the SBCC Campus as Toensmeier discusses the potential of Carbon Farming, one of the best and most doable solutions for the Climate crisis, with an audience of students, faculty and the general public. Carbon is a naturally occurring chemical compound vital to life that provides soil its fertility and water-holding capacity, but since the industrial revolution and the advent of modern farming practices, too much carbon has been released into the atmosphere causing climate disruption. According to Toensmeier, Carbon Farming is a suite of practices that sequester excess atmospheric carbon while producing food and other necessary goods, often with increased yields and ecosystem benefits. The event will explore the global context, but also focus on practices suited to California, including annual cropping, tree intercropping, grazing, silvopasture, perennial crops, and rainwater harvesting. Collectively, Carbon Farming practices are a critical component of climate change mitigation, an effort that requires a speedy transformation of virtually every sector of our civilization. Eric Toensmeier is a lecturer at Yale University, a senior fellow with Project Drawdown, and the author of several books on Permaculture. Toensmeier will be joined by a panel of Santa Barbara community members, who with a diverse audience of faculty, students and general public, will pose questions specific to our region. Hunter Francis, Director of the Cal Poly San Luis Obispo Center for Sustainability, will be the panel moderator. No reservations required. Parking is free on the West Campus on Sundays. Sponsored by Santa Barbara Permaculture Network and the SBCC Environmental Horticulture Dept. The Carbon Farming Solution: A Global Toolkit of Perennial Crops and Regenerative Agriculture Practices for Climate Change Mitigation and Food Security. By Eric Toensmeier, foreword by Dr. Hans Herren. Permaculture & Climate Change Adaptation: Inspiring Ecological, Social, Economic and Cultural Responses for Resilience and Transformation. By Dr. Thomas Henfrey and Dr. Gil Penha-Lopes. California's Grand Plan to Fight Climate Change on the Farm: California lawmakers move toward paying farmers to adopt climate-smart practices. Restoring Global Soil Quality Is One Of The Best Things We Can Do For Climate Change: Little known climate change fact: Just the first meter of soil contains as much carbon as the entire atmosphere. And there's potential to soak up much more. Resilient Agriculture: Cultivating Food Systems for a Changing Climate: By Laura Lengnick. COP21 Insights from the Paris Climate Conference with Albert Bates: Permaculture Realized Podcast Episode 16 (radio interview). 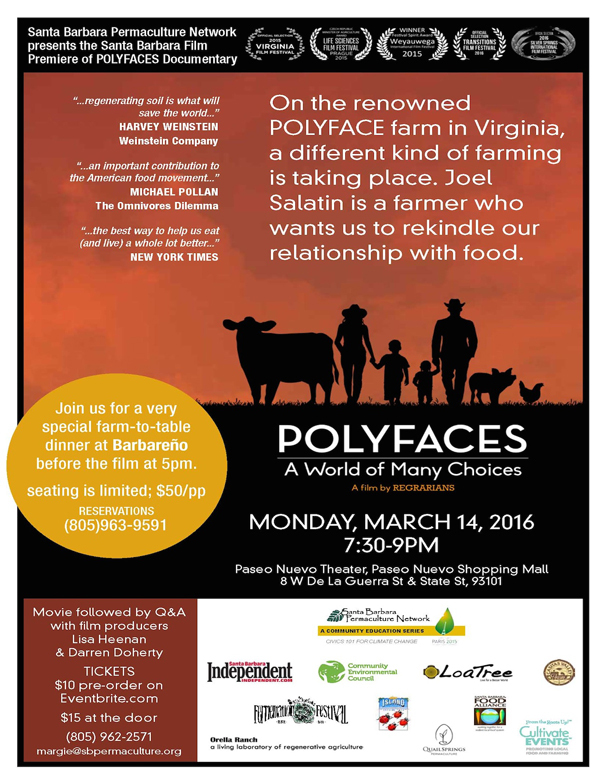 Polyfaces film: Documentary showcasing the work of Joel Salatin and the renowned Polyface Farm in Virginia. Santa Barbara Food Action Plan: A food action plan is a community-driven strategic plan that assesses how we grow, distribute, consume, and dispose of food. While each community tailors the plan to their specific needs, most share two common elements: they capture the aspirations of the community around food and farming, and they identify concrete things that can be done to improve the policies, programs, and individual actions that shape how food moves from farm to plate. CalCAN: The California Climate and Agriculture Network (CalCAN) is a statewide coalition that advances state and federal policy to realize the powerful climate solutions offered by sustainable and organic agriculture. 4 per 1000 Initiative: The aim of the Initiative is to demonstrate that agriculture, and agricultural soils in particular, can play a crucial role where food security and climate change are concerned. Based on robust scientific evidence, the Initiative therefore invites all partners to declare or to implement practical programs for carbon sequestration in soil and the types of farming methods used to promote it (e.g. agroecology, agroforestry, conservation agriculture, landscape management). Have you ever been to a Bioneers Conference? They are epic! For 27 years the place to be to learn about cutting edge ideas shared by Bioneers, the innovators and visionaries of our time, who look deep into the heart of nature for solutions to a better future. 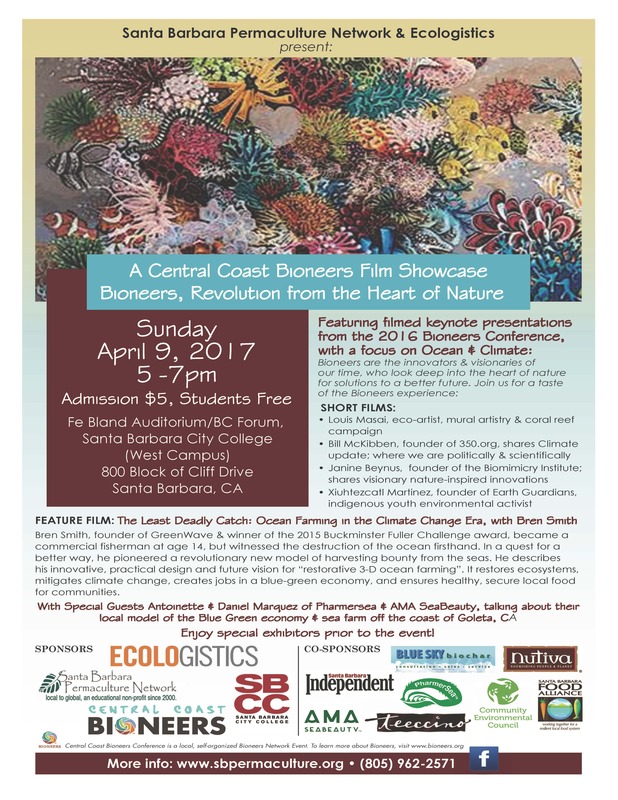 Held annually in San Raphael, CA, we are happy to bring a taste of the Bioneers experience home to our own communities. As California has one of the longest coastlines in the world, the backyard for all our Central Coast communities, we focus on Ocean and Climate, and the exciting idea of a Blue Green economy, that while providing food close to home and creating sustainable livelihoods, also helps restore the health of our oceans and mitigates climate change. Louis Masai, eco-artist, whose exquisite murals, set against the backdrop of city life, explores the eminent loss of the world's coral reefs. Bill McKibben, founder of 350.org grassroots climate campaign, shares Climate update; where we are politically & scientifically, and the groundswell of global citizen engagement. Janine Beynus, founder of the Biomimicry Institute; shares visionary nature-inspired innovations & 2017 Biomimicry awards. Xiuhtezcatl Martinez, founder of Earth Guardians, indigenous youth, environmental activist, rapper, involved with landmark U.S. Federal Climate Lawsuit. With introductions by John Roulac of Nutiva & Daniel Marquez of Pharmersea, and updates from Community Environmental Council (CEC) about the SB County Food Action Plan. Bren Smith, founder of GreenWave & winner of the 2015 Buckminster Fuller Challenge award, became a commercial fisherman at age 14, but witnessed the destruction of the ocean firsthand. In a quest for a better way, he pioneered a revolutionary new model of harvesting bounty from the seas. He describes his innovative, practical design and future vision for “restorative 3-D ocean farming”. It restores ecosystems, mitigates climate change, creates jobs in a blue-green economy, and ensures healthy, secure local food for communities. Followed by a conversation with Daniel & Antoinette Marquez about their local model of the Blue Green Economy, Pharmersea, a 25 acre sea farm off the Ellwood Pier, in Goleta, CA, that provides sustainably harvested ingredients for AMA SeaBeauty skin products. No reservations required. Enjoy special exhibitors prior to the event. Parking is free on the West Campus on Sundays. 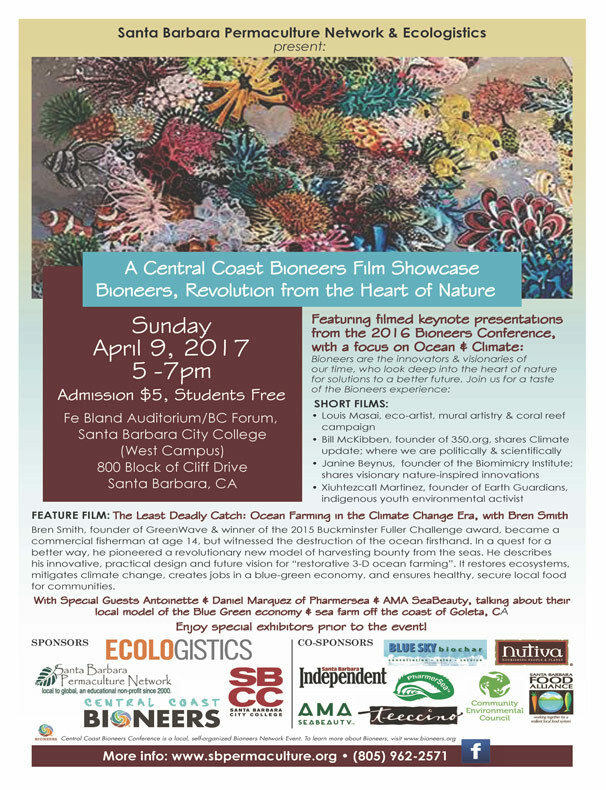 Sponsored by Central Coast Bioneers, Santa Barbara Permaculture Network, Ecologistics, and the SBCC Environmental Horticulture Dept. Central Coast Bioneers: A local, self-organized Bioneers Resilient Communities Network group. Bioneers: Bioneers founder Kenny Ausubel coined the term Bioneers in 1990 to describe an emerging culture. Bioneers are social and scientific innovators from all walks of life and disciplines who have peered deep into the heart of living systems to understand how nature operates, and to mimic "nature's operating instructions" to serve human ends without harming the web of life. Nature's principles kinship, cooperation, diversity, symbiosis and cycles of continuous creation absent of waste can also serve as metaphoric guideposts for organizing an equitable, compassionate and democratic society. The Bioneers radio show is aired locally every Monday at 1 pm on KCBX FM Public Radio 89.5. Pharmersea & AMA SeaBeauty: PharmerSea is a 25-acre sea farm off the Ellwood pier at the foot of the Bacara resort, originally the brain-child of Dr. Michael Neushul. Neaushul Mariculture conducted research in conjunction with UCSB, Scripts Institute of Oceanography and NOAA, and before his death, Dr Neaushul was in the process of developing a library of over 800 seaweed clones that could help manage climate change. PharmerSea has recently launched its first consumer brand, AMA SeaBeauty, a seaweed skin care line that utilizes farm fresh seaweed extracts. Ecologistics: Since its inception in 2010, Ecologistics has hosted five Central Coast Bioneers conferences (2010–2015) as a member of the National Bioneers Resilient Communities Network, and have ongoing environmental programs for San Luis Obispo County & the Central Coast. 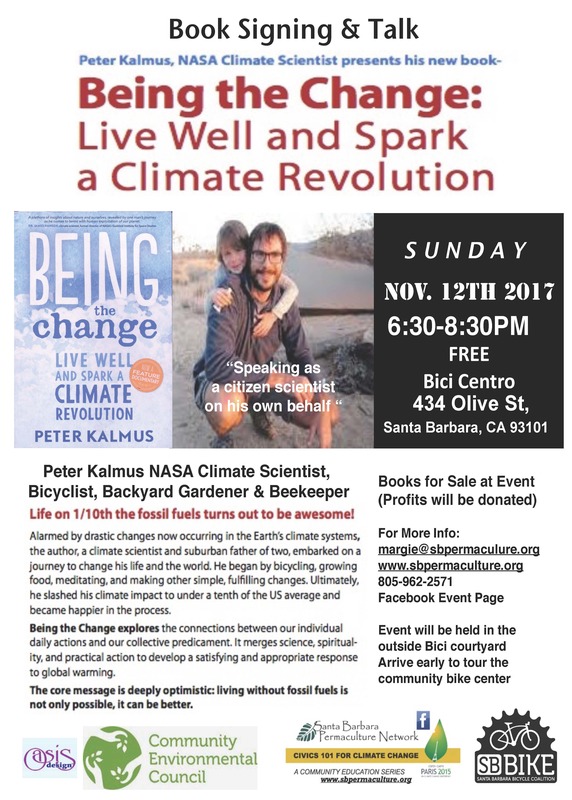 Civics 101 for Climate Change is an ongoing series of events & workshops Santa Barbara Permaculture Network is sponsoring to help citizens understand Climate Change and its implications for our community and region. While many are aware of the problems associated with a changing and unpredictable climate, most have no idea of how to participate or help. In the 21st century, with changes associated with climate and a growing population adding a billion or more in less than 20 years, cities will need to be adaptable and think strategically, with hopefully forward-thinking leaders. What are other cities & countries around the world doing, can we learn from them? With this series we will share what some of the most innovative Permaculture designers and many others are offering as solutions. 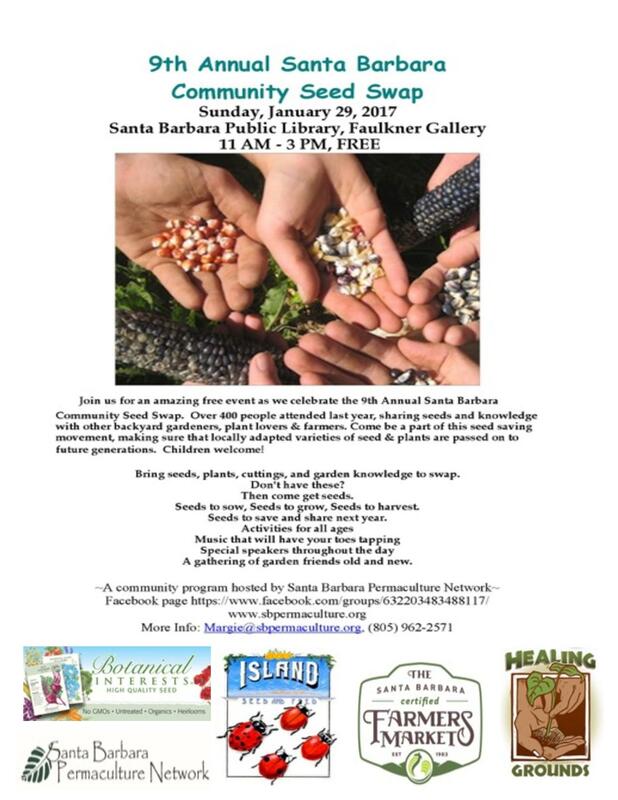 Join Santa Barbara Permaculture Network as it hosts the 2017 9th Annual Santa Barbara Community Seed Swap on Sunday, January 29, from 11am-3pm, at the downtown Santa Barbara Central Library. More than 400 people attended last year, sharing seeds and knowledge with other backyard gardeners, plant lovers, beekeepers and farmers. Come be a part of this seed-saving movement, making sure that locally adapted varieties of seed & plants are passed on to future generations. Special speakers, children activities, and live music! 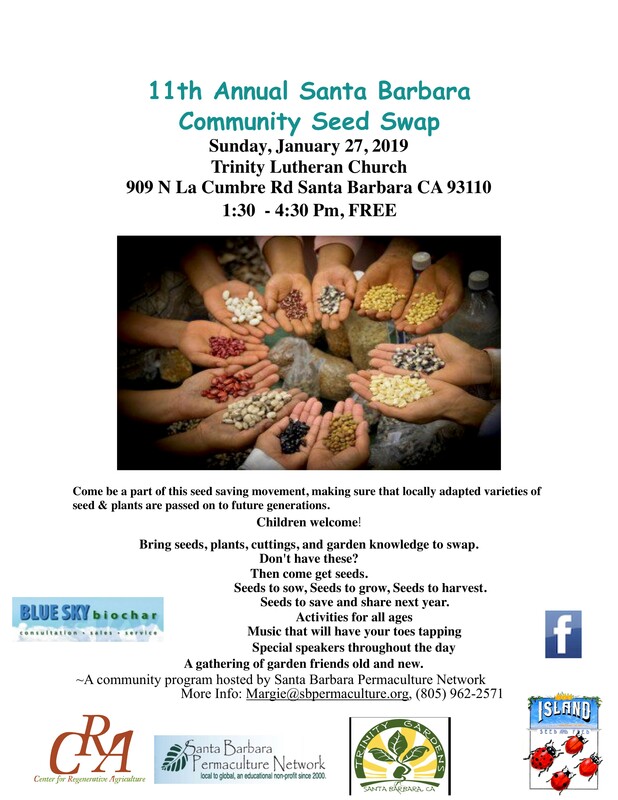 Local groups will table, including the Santa Barbara Seed Saving Guild who will share valuable seed saving techniques and encourage local gardeners to grow out and harvest some of their best seeds for future gardens and seed swaps, making us a truly food secure community. Seed saving is a fun and easy way to connect to the circle of life. 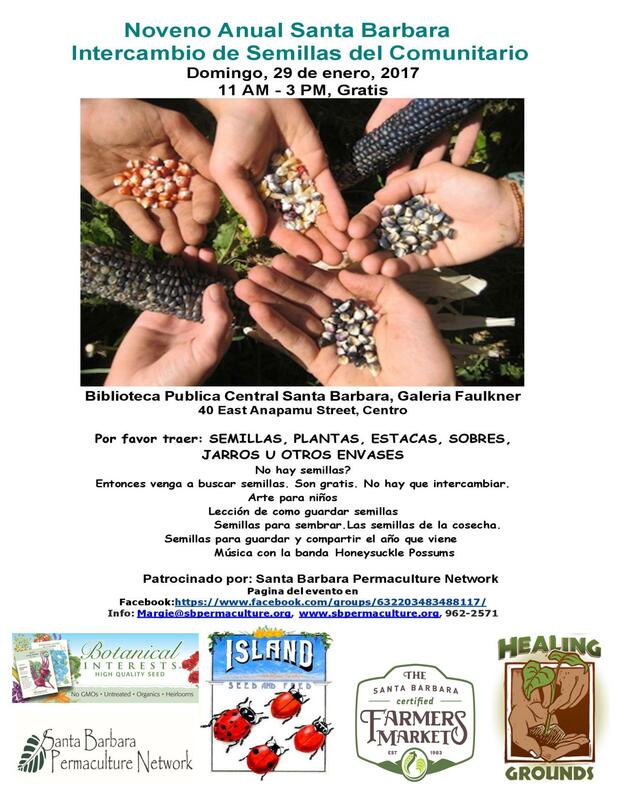 At the 9th Annual Santa Barbara Community Seed Swap, once again we will present a Local Food Hero Award. This time the honor goes to Judy Sims. Judy Sims' contribution to local food systems starts at the very beginning, with the child! An elementary school teacher who taught for many years at Monte Vista school, Judy used her classroom to teach children about the environment through gardens, incorporating outdoor areas into her teaching practices. What kind of gardens? Butterfly gardens, raised bed gardens, and an exquisite half acre ethno botany garden & nature trail, that demonstrates the importance of California native plants, that fed many through the millennia before the arrival of the Spanish. Later, along with the Common Vision school orchard program, Permaculture friends, students & other community members, Judy installed the very first Food Forest/Orchard Garden located at a Santa Barbara public school in 2005. Judy always had programs and projects in mind, not just for her own classroom & students, but for the entire school. Judy's students began growing food from the gardens for a weekly farmers market, where parents shopped when picking up their kids after school. Eventually, with funds raised from the school farmers market, a salad bar lunch program was initiated into the school cafeteria, an award-winning pilot project, that was later adopted district-wide. A worm farm project Judy and students created diverted school food lunch waste from the trash, instead converting it into rich compost for the gardens, along with other school wide recycling projects. In time Judy Sims retired from teaching, but never from gardening. In 2009, she joined the s'Cool Garden team at Santa Barbara City College Center for Sustainability, a part of the Orfalea Foundation School Food Initiative project, as education coordinator, where over 25 local county schools were assisted in starting up and maintaining school gardens. A longtime passionate community activist, Judy has been a key participant in many local garden organizations and projects. With typical creative drive and dynamic energy Judy helped create Trinity Gardens, Santa Barbara's newest community garden. Located on the grounds of Trinity Lutheran Church, it is a unique community garden, where individuals can rent plots, but where there is also a large communal growing area with a farm manager, growing fresh produce for food banks and other organizations who help with the needy. At the La Huerta Historic Gardens, where hardy plants that were needed to sustain those from the early California Mission era are researched and grown on a demonstration site at the Santa Barbara Old Mission, Judy developed a docent program and is an ongoing volunteer. Seed saving is a passion of Judy's, we are grateful for her participation every year with the Annual Santa Barbara Community Seed Swap, providing all the kids activities, and sharing seeds collected from her many garden sources. In assisting the future for children and gardens, in 2015 Judy helped create the first Growing Edible Education Symposium. 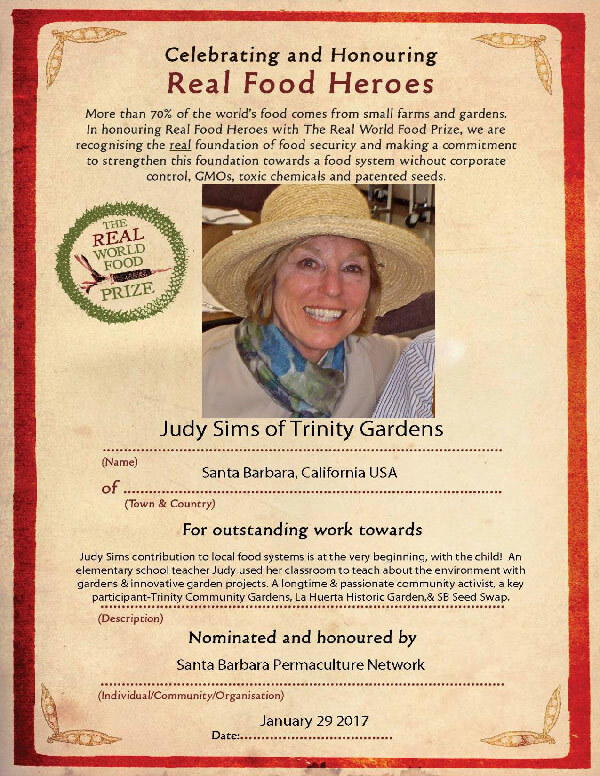 Gardeners, parents, kids, and community members salute Judy Sims, we thank her for her commitment and contribution to gardens, seed saving, and our Santa Barbara food system. She has inspired young and old and in between for many decades. The Local Food Hero award is an international award developed by Vandana Shiva & the Navdanya Foundation to honor those involved in protecting seeds and contributing to a healthy sustainable food system. More than 70% of the world's food comes from small farms and gardens. In honoring Local Food Heroes, we are recognizing the real foundation of food security, and making a commitment to strengthen this foundation. with Darren Doherty of REGRARIANS Ltd. The event is FREE, no reservations are required. There's too much carbon in the atmosphere causing unruly & disturbing climate problems, but the solution isn't difficult, it's in the soil! Carbon is a naturally occurring chemical compound vital to life, but since the industrial revolution and the advent of modern farming practices, too much carbon has been released into the atmosphere causing climate disruption. The good news is that with Carbon Farming & good soil practices, nature can do much of the remedial work for us. 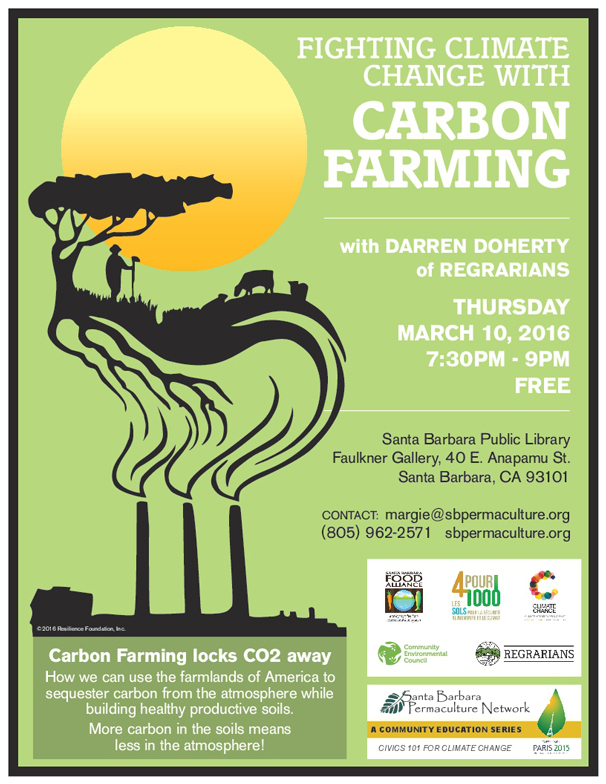 Join Santa Barbara Permaculture Network on Thursday, March 10, as we host Darren Doherty of REGRARIANS Ltd, for a talk that suggests we can effectively fight climate change by improving the soil with innovative Carbon Farming techniques & strategies that restore & regenerate landscapes. Carbon Farming is the process of sequestering carbon into healthy, biologically alive soils, using a variety of agricultural practices like no-till farming, cover crops, holistic range management & agroforestry. America's unique opportunity is it's vast landscapes of degraded agriculture & grazing lands that if restored to health would have the potential to capture billions of tons of carbon from the atmosphere annually. Farms that increase carbon in their soils also increase water retention, protect biodiversity, enhance productivity, all while combating Climate Change. Darren Doherty is a 5th generation Australian farmer and an international expert on regenerative agriculture and permaculture design who has extensive experience across the world in project design, development, management & training. A career-long focus on the profitable & regenerative retrofit of broadacre landscapes has seen Darren Doherty acclaimed as a pioneer in this important field. Darren Doherty & his wife Lisa Heenan have recently produced POLYFACES, a documentary showcasing the work of Joel Salatin & the renowned Polyface farm in Virginia. Darren will also be in the region teaching a sold out 10 day REGRARIAN workshop at Orella Ranch on the Gaviota Coast north of Santa Barbara. Documentary showcasing the work of Joel Salatin & the renowned Polyface Farm in Virginia. Pre-order tickets are available on Event Brite for $10, or $15 at the door. On the renowned POLYFACE farm in Virginia a different kind of farming is taking place with Joel Salatin, a farmer who wants us to rekindle our relationship with food. Please join Santa Barbara Permaculture Network on Monday, March 14, at the Paseo Nuevo Theater for the Santa Barbara premiere of POLYFACES, a documentary film about Joel Salatin and the renowned Polyface farm in Virginia that has been demonstrating some of the best regenerative & sustainable agriculture practices for over 40 years. In 1961, William and Lucille Salatin moved their young family to Virginia's Shenandoah Valley, purchasing the most worn-out, eroded, abused farm in the area. Using nature as a pattern, they began the healing and innovation that now supports three generations. Disregarding conventional wisdom, the Salatins planted trees, built huge compost piles, dug ponds, moved cows daily with portable electric fencing, and invented portable sheltering systems to produce all their animals on perennial prairie polycultures. In time son Joel Salatin took the helm, teaching and authoring books on all that was learned at Polyface through the years. Eventually the farm became a major demonstration site with hundreds of people visiting annually, sharing knowledge on how to produce food without harmful chemicals, while respecting animals in their care, and ultimately returning the farm to a healthy ecosystem. A Heinz Award winner, Joel Salatin was called the ‘most innovative farmer in the world' by Time Magazine. He was featured in both the Oscar-nominated film Food Inc., and Michael Pollan's best selling book, The Omnivore's Dilemma. Joel Salatin is an inspiration to many thousands of farmers around the world. The film's producer Lisa Heenan shared directing duties with daughter Isabella Doherty, chronicling the farm over four years of changing seasons. The film was produced by REGRARIANS Ltd., an Australian nonprofit established with partner Darren Doherty to provide resources for those who want to regenerate depleted landscapes. Darren Doherty is one of the world's leading regenerative agriculture specialists, who has long advocated for the repair of broadacre landscapes as one of the solutions for climate change by sequestering carbon in biologically alive soils, and will be in Santa Barbara for a sold out workshop he will be teaching on the Gaviota Coast. Both Lisa Heenan & Darren Doherty will be in attendance at the Santa Barbara film premiere. Welcome to EditPad.org - your online plain text editor. Enter or paste your text here. To download and save it, click on the button below. Polyfaces – Early in the Morning from RegrariansMedia on Vimeo. Reporting from the Paris Climate Conference What does COP21 mean for Santa Barbara & California? While much still to be done, let's take a moment to Celebrate! Free. No reservations are required. 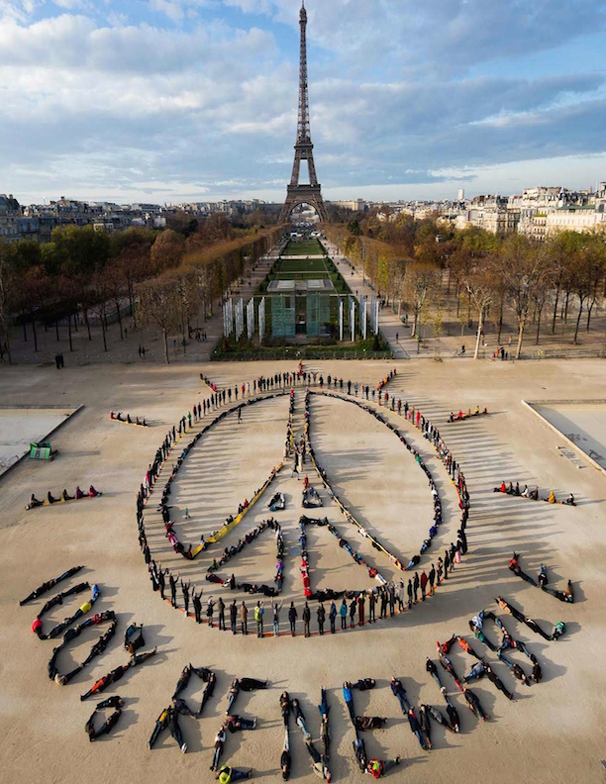 Did you follow the Climate Talks in Paris, wonder what they meant to you and your community? 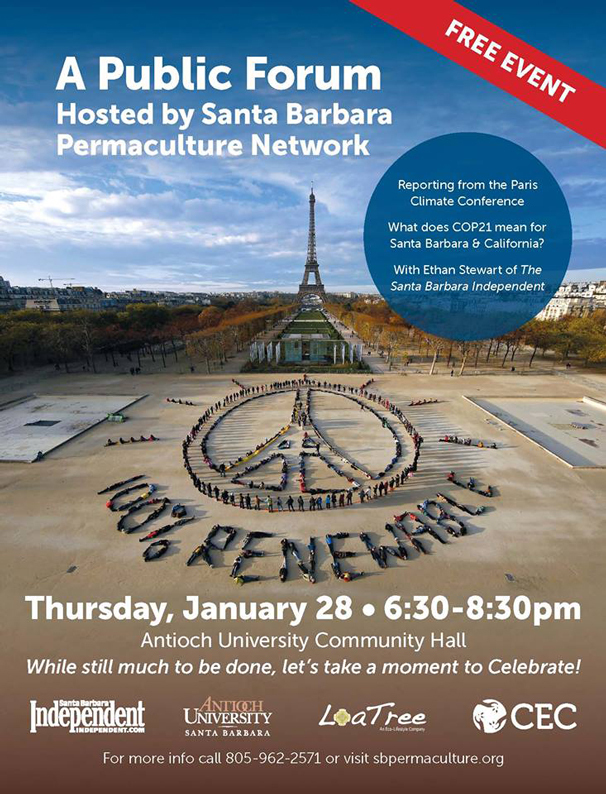 Please join Santa Barbara Permaculture Network on Thursday, January 28, for an evening with Ethan Stewart of the Santa Barbara Independent, as he shares his experiences attending & reporting on the 2015 Climate Conference in Paris (COP21). Doing a particularly insightful job covering the Climate talks, Ethan gave a day by day account of all that took place, both at official gatherings and the myriad sidebar gatherings and meetings with NGOs, activists, and concerned citizens from around the world. What was it like to be at this historic gathering of delegates & negotiators from 195 countries with widely varying agendas while needing to unanimously adopt an agreement that will profoundly affect all of our futures? What was the process, who inspired, who disappointed, did he come away with euphoria or despair? And ultimately, what are the implications of the Paris Agreement for our city, county and state? The goal of COP21 was to achieve a legally binding and universal agreement on climate, with the aim of keeping global warming below 2 degrees Celsius. And for the first time in more than 20 years of UN negotiations, although not legally binding, global consensus was reached. Unlike past conferences, this time cities and local governments were identified as key problem solvers, with more than 400 mayors from around the world attending the Climate Summit for Local Leaders. As the world's eighth largest economy, California has the potential for emerging as a leader for global climate change solutions, with innovative clean technologies for the 21st century that are not only good for the planet, but also job creators and profitable for business. Come learn more from all Ethan Stewart experienced and join the conversation with a panel of key community members from backgrounds in local government, business, education, faith based organizations, activists and students, exploring what it might be like to transition from a century of an economy based on fossil fuels, to a restoration economy where our energy needs are supplied largely with renewables. What part will we all play? Ethan Stewart has been on staff at the Santa Barbara Independent since 2004. Currently Editor-at-Large for the Independent, Stewart has been its primary environmental reporter for much of the past decade. A lifelong lover of the great outdoors, Stewart's work has been honored by both state and national organizations for excellence in everything from "Investigative Journalism" and "Sports Writing" to "Environmental Reporting" and "Best Writing" in California in 2014 from the California Newspaper Publishers Association. The activities of cities alone account for more than 70 percent of energy-related carbon dioxide emissions. Roughly 54 percent of the world's 7.3 billion people currently live in cities and by 2050, that number is expected to rise to around 70 percent of the world's population. If the world is to avoid catastrophic climate change, we need our cities to continue to lead by developing and implementing concrete initiatives that improve the health, well-being and economic opportunities of citizens. Join Santa Barbara Permaculture Network as it hosts the 8th Annual Santa Barbara Community Seed Swap on Sunday, January 31, from 11am-3pm, at the downtown Santa Barbara Central Library, Faulkner Gallery. More than 400 people attended last year, sharing seeds and knowledge with other backyard gardeners, plant lovers, beekeepers and farmers. Come be a part of this seed saving movement, making sure that locally adapted varieties of seed & plants are passed on to future generations. Special speakers, free seeds, children activities & live music! 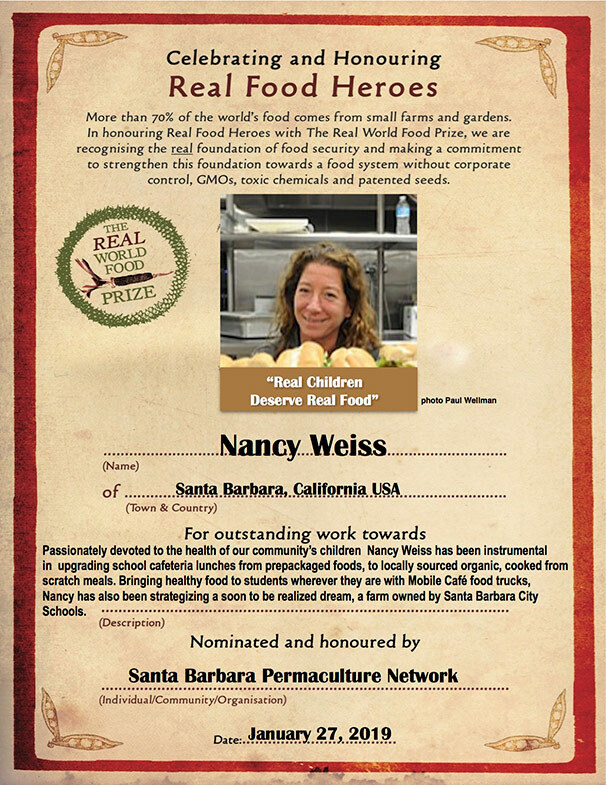 Once again we will be honoring a local "Real Food Hero" at the Santa Barbara Community Seed Swap. 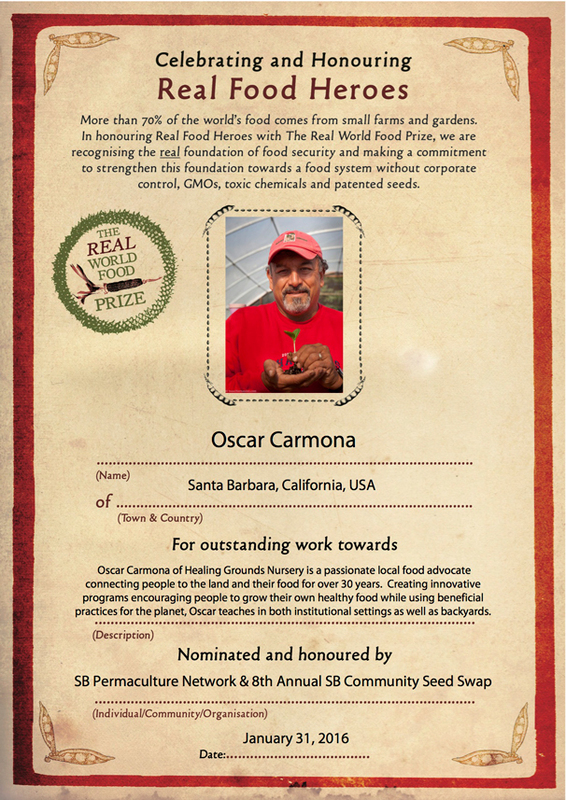 This year the award goes to Oscar Carmona of Healing Grounds Nursery, a passionate local food advocate connecting people to the land & their food for over 30 years. Creating innovative programs encouraging people to grow their own healthy food while using beneficial practices good for the planet, Oscar teaches in both institutional settings & backyards. From 1991 to 2004 Oscar was the Director of Garden Programs for the Community Environmental Council (CEC) in Santa Barbara, CA where he managed the City of Santa Barbara's community gardens and CEC's Urban Farm. He started CEC's Green Schools Gardening Program, Farming Fun Summer Camp, the Santa Barbara Youth Gardening Coalition, taught Green Gardener's Sustainable Practices courses, and served as the President of the Santa Barbara Horticultural Consortium. 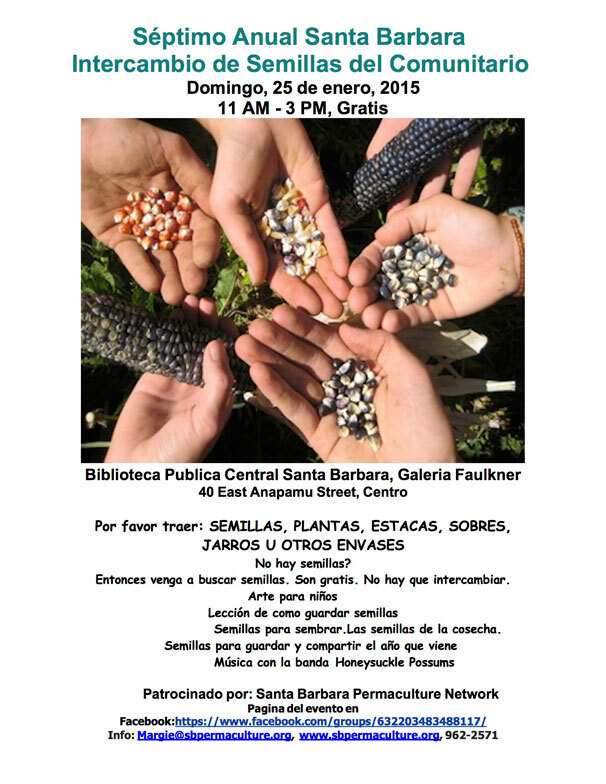 Because the Seed Swap keeps growing, this year we would like to be both inside and outside at the downtown Santa Barbara Central Library. Always inside because of chance of rain (yes please! ), but this year would like to have additional space outside for children's activities & music, and to be more visible to the public. As always we could a little help from the community to pay for the library facility and associated costs. The cost to use the Faulkner Gallery indoor space is $400, for the outdoor space, an additional $200. All tax deductible donations large or small welcome! Two creative minds honor the Community Environmental Council's 45th Anniversary with a conversational journey exploring the past & future of the environmental movement, including a discussion of Paul Relis' recently published book, Out of the Wasteland - Stories from the Environmental Frontier. Paul Relis is the founding executive director of the Community Environmental Council, who at the young age of twenty three, following the disastrous oil spill in the Santa Barbara Channel in 1969, helped launch an organization whose impact is still being felt locally & globally today. Pico Iyer, global traveler & sometime Santa Barbara resident, is an internationally acclaimed author & journalist with more than ten best selling books, whose global citizen perspective helps us understand the world we live in. 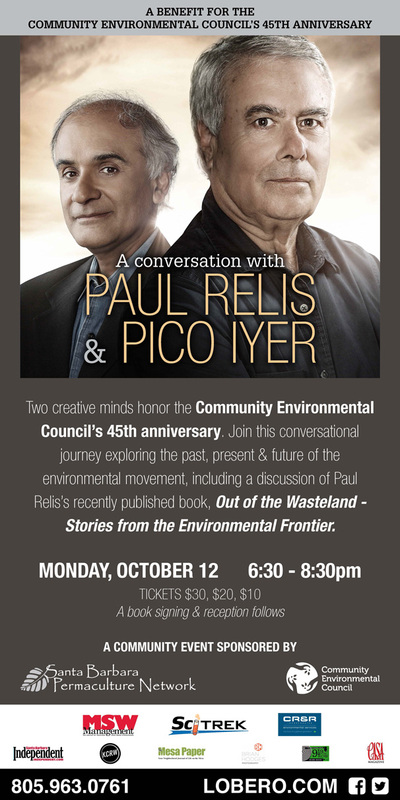 Join us for a thought provoking evening as Paul & Pico, personal good friends, lead us with infectious abandon into a lively conversation about what the future might hold, as we contemplate our environmental destiny in our Santa Barbara home town and on the planet. A book signing reception follows the talk. Paul became the founding executive director of the Community Environmental Council (CEC) after the oil spill in the Santa Barbara Channel in 1969. Paul then became an executive with the state EPA, and lectured for nearly two decades on Environmental Studies at his alma mater, UCSB. Paul feels his current work with CR&R Inc, a company developing a 30 million dollar Anaerobic Digester at a facility in Perris, CA, opening in three months with a carbon free, ultra low emissions biofuels created from organic waste, is the exciting culmination of all his work, fulfilling a dream of making our community and state less reliant on oil for energy. No reservations are required. More info: margie@sbpermaculture.org, 805-962-2571. Can our impact on the planet be a positive instead of negative one? 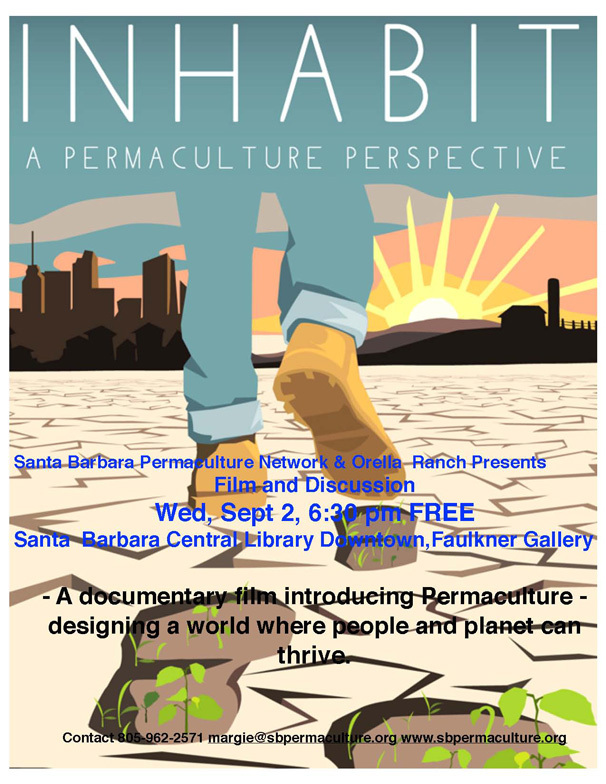 Join us for an evening of Permaculture inspiration at the Santa Barbara Premiere of INHABIT, a feature length documentary introducing permaculture. The award-winning documentary INHABIT - A Permaculture Perspective showcases permaculture projects and the way they regenerate our world. INHABIT explores the many environmental and agricultural issues facing us today and examines solutions that are being applied using the ecological design process called 'Permaculture'. Permaculture is a design science based on the observation and replication of patterns and relationships found in nature; it is an approach to designing sustainable systems of agriculture, community, economics, politics, and more. INHABIT looks at practices in rural, suburban, and urban environments to explore the breadth of response to local and global challenges - from issues of food, water, and medicine, to governance, economy, and culture. It is an attempt to illuminate certain societal and planetary ails through the lens of on-ground, Earth-based solutions. *On hand for the evening will be Guner Tautrim from Orella Ranch where Keyline design & other permaculture strategies have been incorporated into their landscape with positive results. 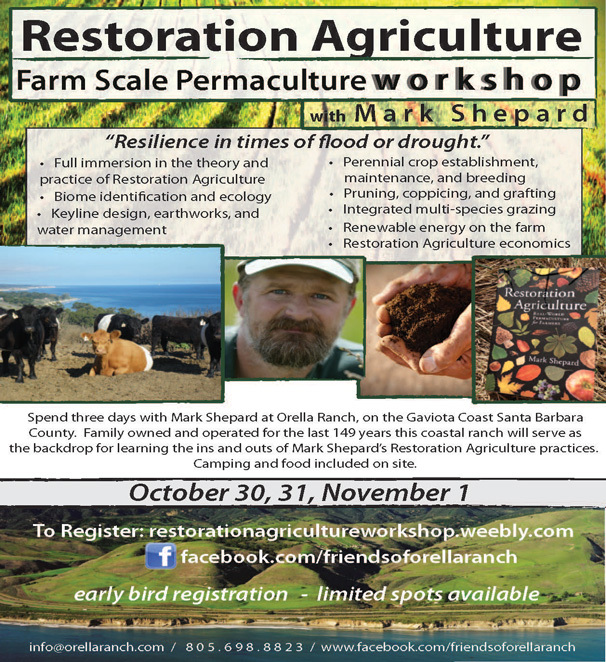 Orella Ranch will host an upcoming 3 day workshop with Mark Shepard, author of Restoration Agriculture, whose work and farm is featured in the INHABIT film. INHABIT: A Permaculture Perspective from Costa on Vimeo. Spend Friday October 30, 31st and Nov. 1st with Mark Shepard on the Orella Ranch, Gaviota Coast Santa Barbara County. Family owned and operated for the last 149 years this coastal ranch will serve as the backdrop for learning the ins and outs of Mark Shepard's Restoration Agriculture practices. Camping and food included on site. In the first half of the 20th century, California's population increased by 600% and by the 1950's development was consuming coastal open space and farmland to housing development & shopping malls in a way that seemed to have no limits. A stunningly beautiful film narrated by Frances McDormand, Rebels With A Cause is the tale about the dreamers and schemers and activists who - despite reversals, diversions and disappointments - persist in their mission for more than twenty years and foster a national movement beginning in California to preserve open space that ultimately grew into a legacy of National Seashores, National Parks and National Recreation Areas around the nation. It's the story of garden clubs, ranchers, farmers conservationists, politicians, widows and volunteers, all of whom worked their way through compromise and negotiation with the American public coming up as the winner. It's a struggle that crosses party lines, unites seemingly antagonistic foes, falters and is nearly extinguished many times along the way, but ultimately is victorious. Beautiful cinematic footage, clever animation, moving interviews and a very compelling story are woven together in story that is especially meaningful for our times. Award winning filmmakers Nancy Kelly and Kenji Yamamoto of Kelly+Yamamoto Productions capture breathtaking natural landscapes while chronicling the story of an unusual group of individuals who make monumental change to help preserve a landscape for future generations. Santa Barbara Permaculture Network invites community members, leaders, educators, students, and all who care about land preservation to attend and join the discussion about preservation of not only open space, but also agricultural lands in trust, urban community landtrusts, and how future generations can participate in preserving our own beautiful and unique landscape. 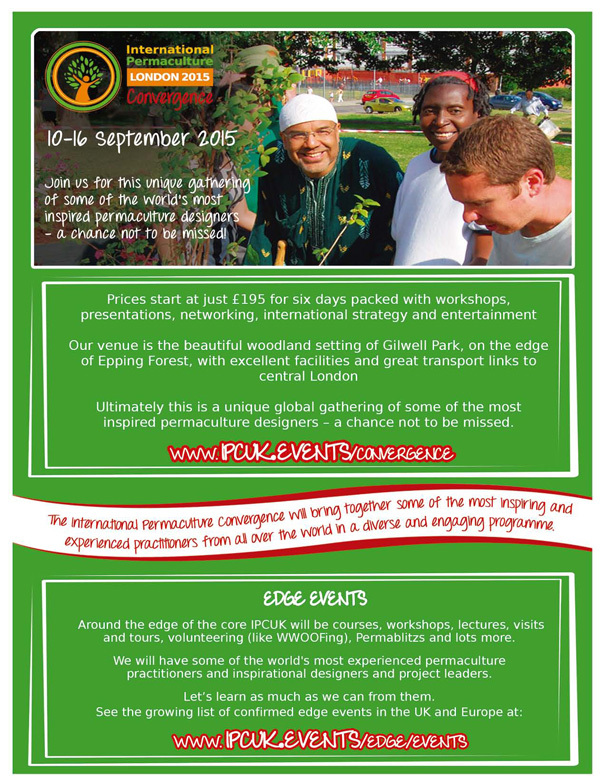 In September 2015 up to a thousand people from over fifty countries will be converging on London for a unique global gathering of people passionate about permaculture and those exploring its relevance to our pressing challenges. It's going to be an amazing month that draws on our movement's growth. The IPCs were started as a way of growing the network, sharing knowledge and celebrating achievements. With no formal international body, IPCs have been one of the few opportunities to have discussions in person about strategy, educational standards, research, developments in practice, and regional / global development. They have also been a way to highlight best practice in specific environments, and to increase permaculture in the host country – especially in the early days. At the 10th IPC in Jordan it was agreed to have the 12th IPC in Britain. IPCUK will bring together leading experts and practitioners from around the world. We have everything we need to create a sustainable world and future. Together we will create a vision of a near future society that is caring, sustainable and fair, and explore how we can collectively design strategies and pathways to make it happen. A two day Conference takes place September 8 & 9th for the public and permaculture community, followed by the 5 day (Sept 10-16) International Permaculture Convergence (IPC), the biennial global gathering of over 500 expert permaculture designers and practitioners (Permaculture Design Course required to attend). 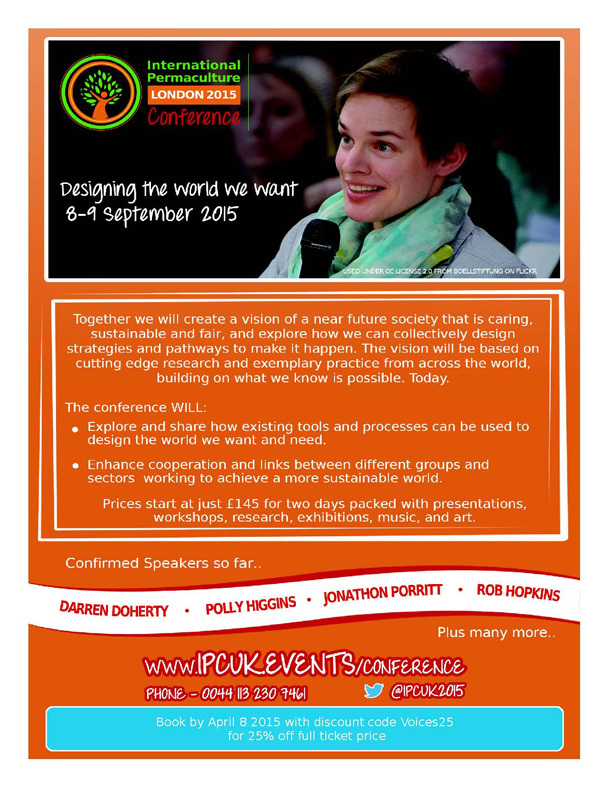 Conference, https://www.ipcuk.events/conference 8-9 September 2015, The Light, Euston Road, London. Designing the World We Want - two days packed with presentations, workshops, academic papers, exhibitions, music, and art..
Convergence, https://www.ipcuk.events/convergence 10-16 September 2015, Gilwell Park, Essex. Designing the network we want - for people from around the world using permaculture in their everyday lives and communities. Edge events, https://www.ipcuk.events/edge throughout the UK and Europe. From tours and courses, to talks and more. 'IPC' stands for International Permaculture Convergence, it is a gathering of practitioners of permaculture from around the world, people who are working with nature to design a better world. IPCs started back in 1984 in Australia, and is the key global meeting point for the international permaculture network. It is fully self-financed, so donations https://www.ipcuk.events/donate and sponsorships if your business is interested in sponsoring any part of the conference or convergence. The Friends of the International Permaculture Convergence (FIPC) nonprofit is an organization working in conjunction with the International Permaculture Convergence Coordinating Committee to support the conveners of the individual International Permaculture Convergence (IPC) event held around the globe every two years. FIPC's specific mission is to augment the funds needed for convening the bi-annual IPC event, with a special focus on scholarship funding for delegates traveling from all parts of the world to attend. Ongoing support for the IPC website with its valuable archives is also a part of the FIPC mission. 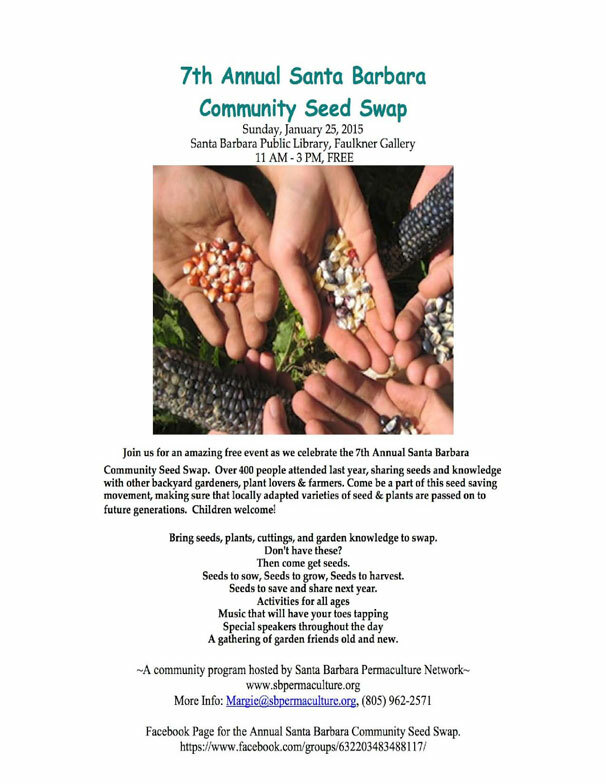 Join Santa Barbara Permaculture Network as it hosts the 7th Annual Santa Barbara Community Seed Swap on Sunday, January 25, from 11am-3pm, at the downtown Santa Barbara Central Library, Faulkner Gallery. More than 400 people attended last year, sharing seeds and knowledge with other backyard gardeners, plant lovers, beekeepers and farmers. Come be a part of this seed saving movement, making sure that locally adapted varieties of seed & plants are passed on to future generations. Special speakers, children activities & live music! $5-10 Sliding Scale. No reservations required. Learn how businesses & organizations around the world are "thinking smarter in circles"
Dynamic Governance (aka Sociocracy) is an elegantly simple, innovative new method of governing that creates more inclusive and efficient organizations, while creating better human relationships. Join long time Dynamic Governance pioneers and experts John Buck and Manfred Friedrich for an introductory talk on Friday, January 9, as they share the ideas and concepts of Dynamic Governance as a way to empower and bring out the best in people working together for a common purpose. First developed and honed in the Netherlands, Dynamic Governance has spread around the world and is currently used by several thousand organizations with inspiring results. Working in a wide range of settings including families, volunteer groups, community organizations, non-profits, government agencies, schools and universities, small businesses and large corporations, Dynamic Governance rewires the decision-making process to mine the intelligence and creativity that already exist in organizations. Structured around self-organizing circles that make policy decisions and assign tasks and responsibilities through various group processes that engage the perspectives, skills, sympathies, and inspirations of all the members of a group, Dynamic Governance then strategically connects these individual circles to a wider interlinked organizational network. John Buck co-authored We the People: Consenting to a Deeper Democracy, a book about a new, more inclusive way of governing ourselves using Dynamic Governance; and is the Division Director of The Sociocracy Group in the Netherlands, consulting with businesses, nonprofits, and collaboration councils around the world. Manfred Friedrich is entrepreneur, organization builder, and mediator who uses Dynamic Governance to support organizations whose intentions are to foster collaboration, equality, personal growth, transparency and better decisions. Endorsers:Earth First Construction, Sweetwater Collaborative, Sama Group Santa Barbara, Center for Nonviolent Communication. 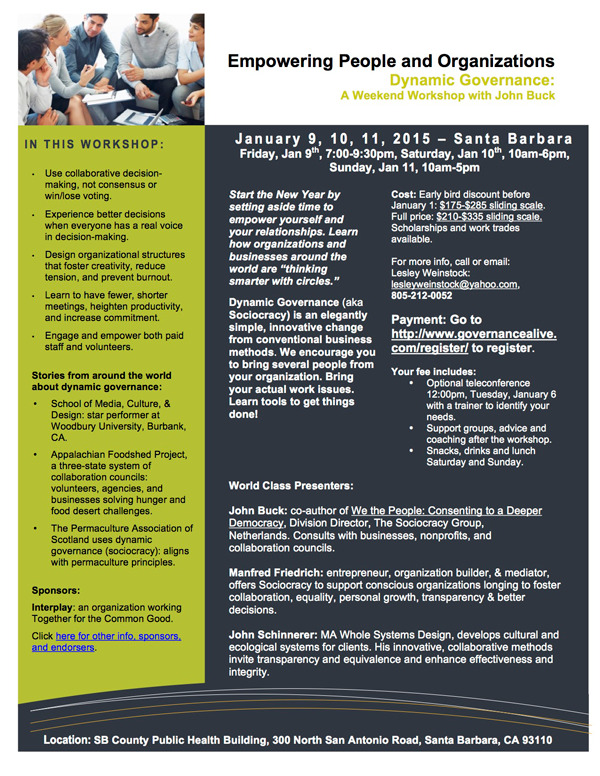 A two day Dynamic Governance workshop takes place on Jan 10th & 11th, see below for details. Cost: Early bird discount before January 1: $175-285 sliding scale Full price: $210-$335 sliding scale Scholarships and work trades available. Empowering People and Organizations Dynamic Governance: A Weekend Workshop with John Buck, Manfred Friedrich & John Schinnerer. Santa Barbara County Public Health Building, 300 North San Antonio Road, Santa Barbara, CA 93110. Dynamic Governance (aka Sociocracy) is an elegantly simple, innovative change from conventional business methods. We encourage you to bring several people from your organization. Bring your actual work issues. Learn tools to get things done! :: Use collaborative decision-making, not consensus or win/lose voting. :: Experience how everyone can have a real voice in decision-making. :: Design power structures that foster creativity, reduce tension and prevent burnout. :: Engage and empower both paid staff and volunteers. Payment: To register please go to: http://www.governancealive.com/register/ Scroll down to find the Santa Barbara workshop. :: Optional teleconference 12:00pm, Tuesday, January 6 with a trainer to identify your needs. :: Support groups, advice and coaching after the workshop. :: Snacks, drinks and lunch Saturday and Sunday. John Buck: co-author of We the People: Consenting to a Deeper Democracy, Division Director, The Sociocracy Group, Netherlands. Consults with businesses, nonprofits, and collaboration Councils. Manfred Friedrich: entrepreneur, organization builder, and mediator, offers Sociocracy to support conscious organizations longing to foster collaboration, equality, personal growth, transparency and better decisions. John Schinnerer: MA Whole Systems Design, develops cultural and ecological systems for clients. His innovative, collaborative methods invite transparency, equivalence and enhance effectiveness and integrity. :: The School of Media, Culture, and Design: star performer at Woodbury University, Burbank, CA. :: The Appalachian Foodshed Project, a three-state system of Collaboration Councils with hundreds of volunteers, agencies, and businesses, is solving hunger and food desert challenges. ::The Permaculture Association of Scotland has adopted dynamic governance (sociocracy) as its governance system because it aligns with permaculture principles.